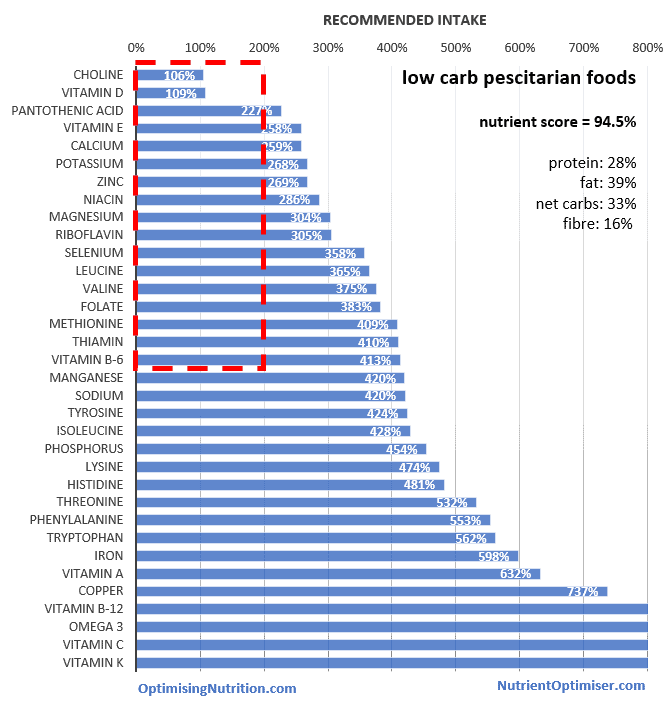 macronutrient and micronutrient extremes (low carb, keto, high protein, low protein, etc.). Most people do well if they eat foods that have a higher nutrient density. However, we can tailor our food choices beyond nutrient density to better suit different people with different goals. The ‘nutrients column’ shows the micronutrient profile of each of these approaches. If you click on the ‘foods’ column you’ll be directed through to the Nutrient Optimiser which will give you your personalised list of foods. If you belong to the 50% of the population that has diabetes or pre-diabetes, your priority should be to normalise your blood glucose levels with a lower insulin load diet. You can use your current blood sugar levels to choose the nutritional approach that will best support your journey towards optimal metabolic health. The well-formulated ketogenic diet approach is designed for someone who has very high blood sugars or requires therapeutic ketosis. The diabetes and nutritional ketosis approach will be more nutritious and suit people looking to manage their diabetes. Before too long, with the reduction of processed carbohydrates, your blood sugar levels will stabilise to more optimal levels. Once you have your blood glucose levels under control, you can then focus even more on increasing nutrient density and reducing energy density if you are looking to lose weight. The weight loss (insulin resistant) foods will help you to reduce the energy density of your diet while keeping the insulin load down. Stabilising blood sugar levels, normalising insulin levels and reducing hyper-palatable processed carbs will help many normalise their appetite, reduce food cravings and naturally eat less. 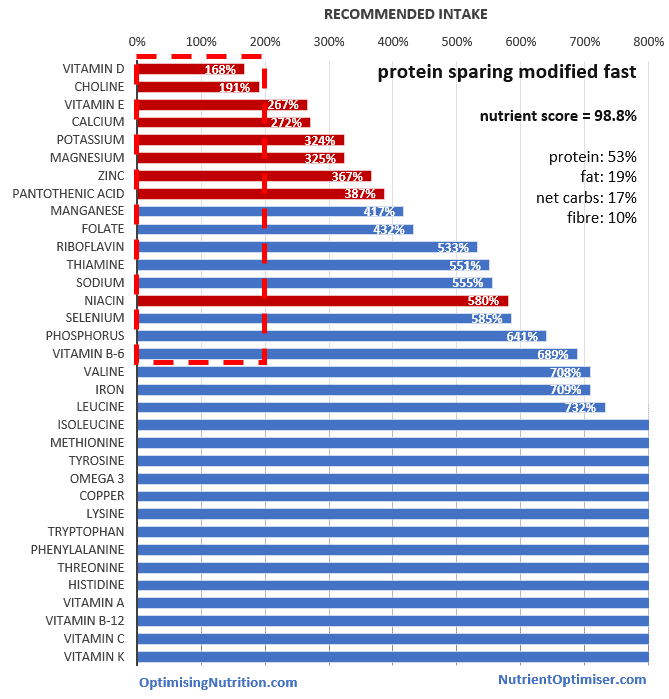 The protein-sparing modified fast (PSMF) approach aims to provide all the essential vitamins, minerals and amino acids with the minimum amount of energy to enable you to achieve aggressive weight loss while minimising your chance of developing nutrient deficiencies, managing cravings and preserving your lean muscle mass. In the long run, you may even find you have the energy to work out or build muscle for fitness and longevity. This increased level of activity may require higher levels of protein and other nutrients. You may also need higher energy density foods to enable you to ingest enough energy to support your activity levels. 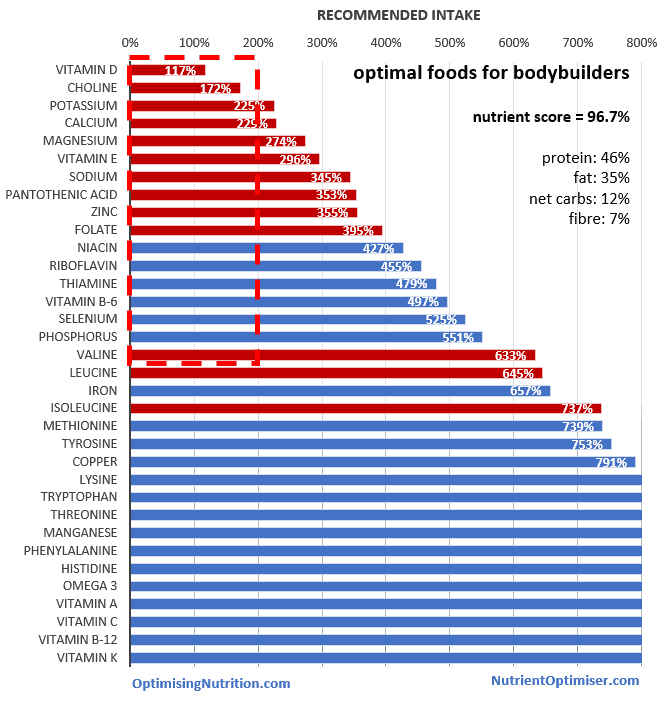 The bodybuilder food list will provide you with plenty of amino acids and minerals to support recovery while the endurance athlete food list increases energy density to fuel increased activity levels while still keeping nutrient density high to fuel activity levels. 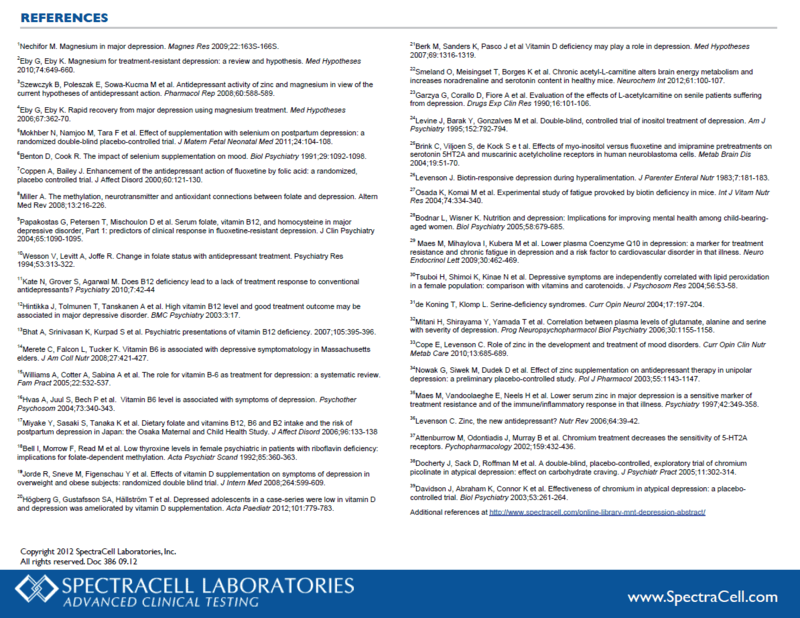 How do I implement all this information? Not that long ago, before the advent of artificial flavours, colourings, refrigerators and packaged food, we were more in touch with our actual nutritional needs and went hunting and gathering in search of the foods that contained the nutrients we needed. We would naturally eat more of what nature provided in preparation for winter. We ate until we got what we needed from the food and stopped. These food lists would help you to refine your food choices and make up for your appetite that might have been corrupted by the modern food system. When you go shopping each week try to buy more of the foods that are at the top of your list and make sure you find a way to incorporate them into your cooking during the week. You may find that you like some more than others. Keep working down the list until you find foods that you enjoy. You may need to do more food preparation rather than on processed and pre-packaged foods. It may take a little bit more effort, but your health is worth it! Most people are somewhere on the spectrum of metabolic health and will do well focusing on the foods that keep their blood sugars stable. 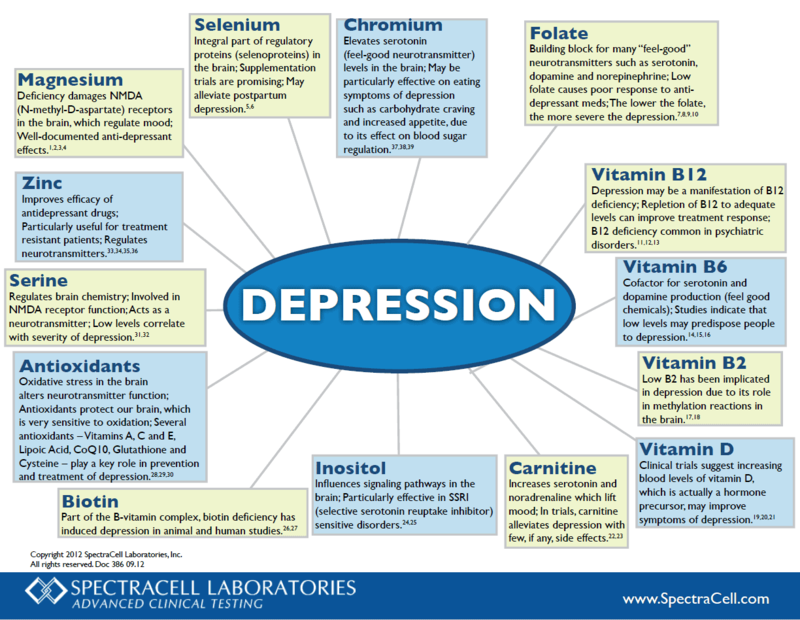 There are others that have developed specific conditions exacerbated by long-term nutrient deficiencies. 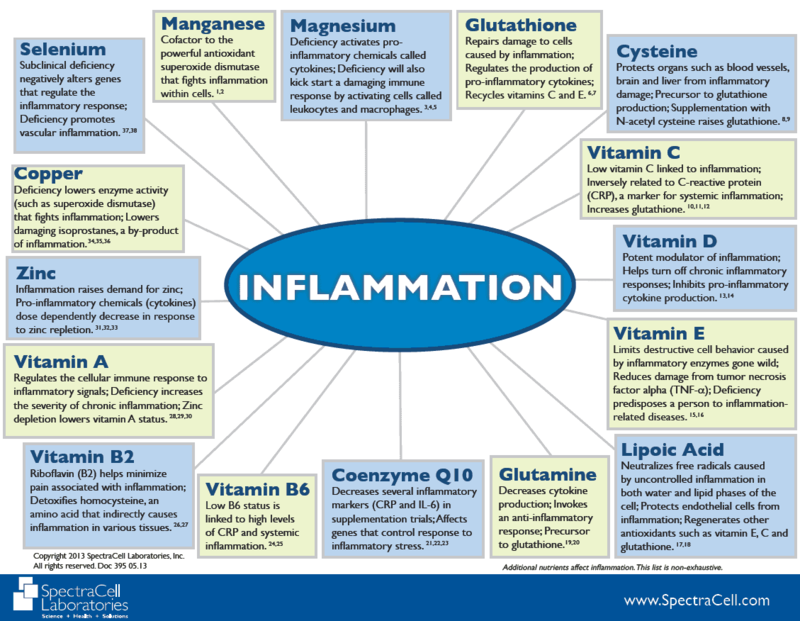 Hence, focusing on the foods that provide more of the nutrients associated with these conditions can help manage or even reverse some of these conditions for some people. 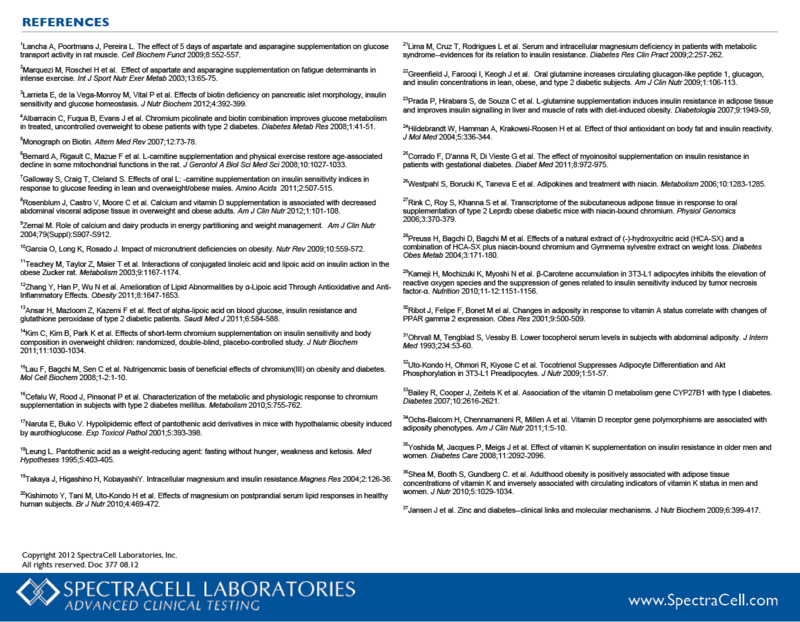 The table below contains details of a range of food lists that are designed to provide more of the nutrients to various health concerns. Eating these foods will not guarantee a reversal of a particular condition. However, prioritising these foods will improve your chances of recovery and minimise reliance on drugs and other medicines. If you don’t yet have any of these conditions, simply focusing on the most nutrient-dense foods may reduce your chances of developing any of these conditions and help you maintain optimal health for as long as possible. Some foods make an appearance on many of the lists (e.g. spinach, watercress, broccoli, organ meats). However, each list is unique in their ranking of the various foods. While eating any of the foods on the list will be helpful, focusing on the foods towards the top of the list will maximise the nutrients you need for your condition. 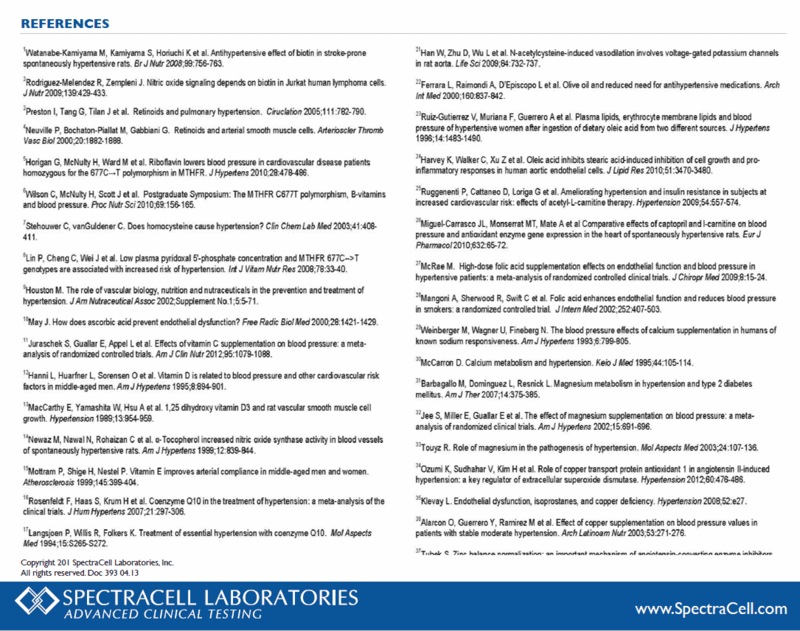 The nutrients prioritised in these lists are generally based on research compiled by Spectracell which identified nutrients that are typically deficient in a range of conditions. 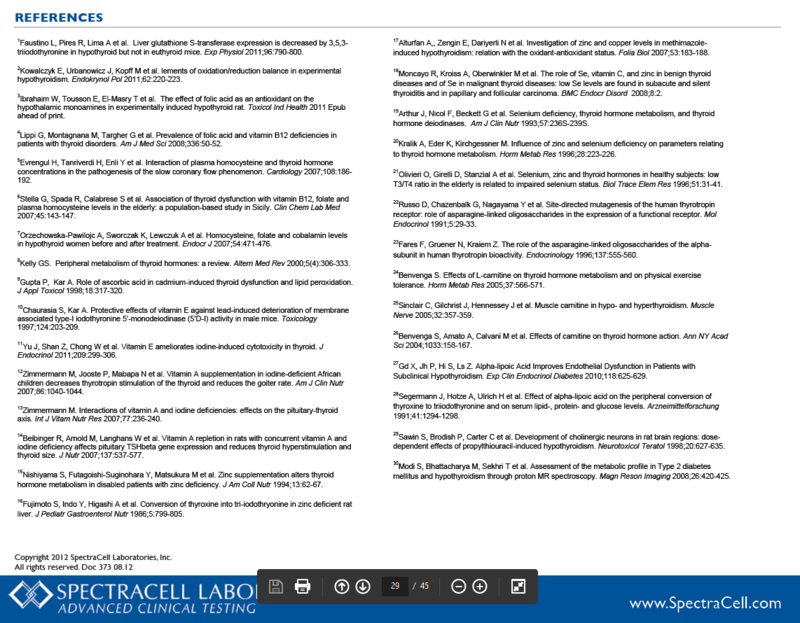 You can click on the “wheel” and “references” in the table for more details. 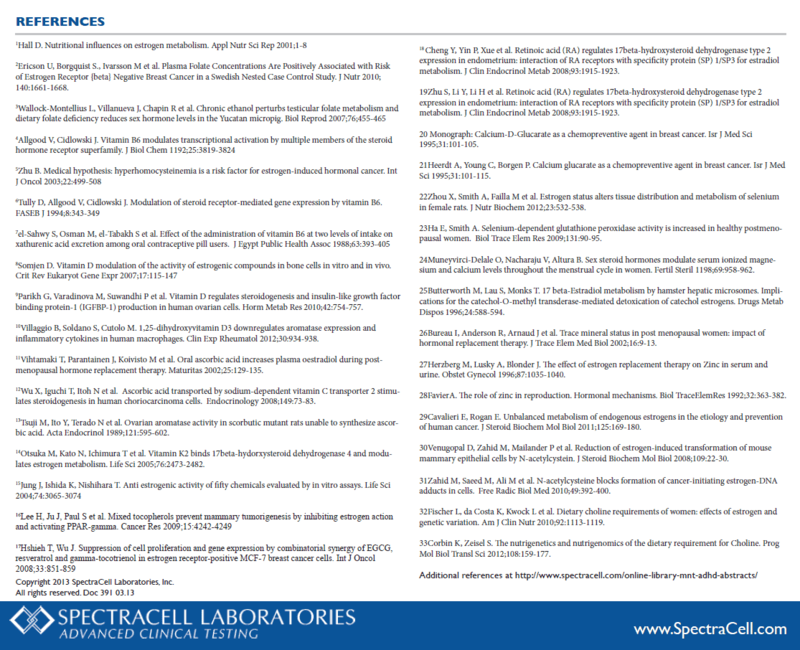 Check out the full Spectracell nutrient wheels for a range of conditions here. 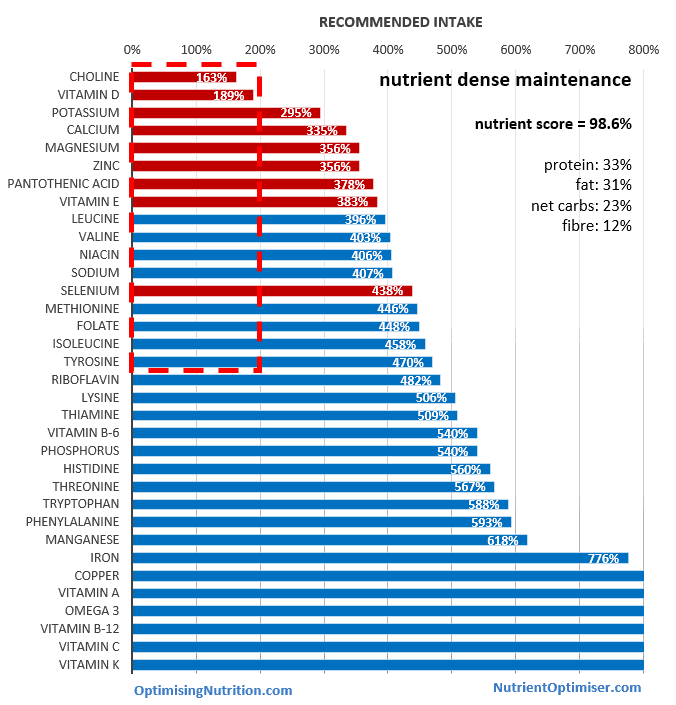 Where there is no Spectracell “wheel” available, the nutrients used in the analysis were based on the Nutrient Bible by Henry Oseki which is an excellent detailed resource on the individual nutrients as well as the likely nutrients to support various conditions. 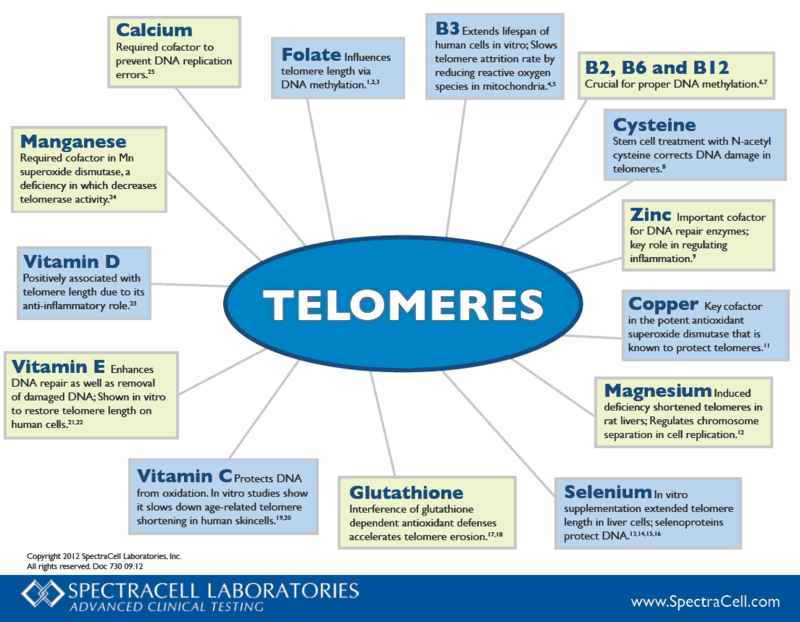 By adding in a smattering of nutrients that our body actively seeks (e.g. iron, folate, B vitamins, sodium etc) we will maintain an increased appetite for these foods while not getting the range of other nutrients that are also important but do not drive our appetite to the same degree (e.g. potassium, magnesium, choline and vitamin E). 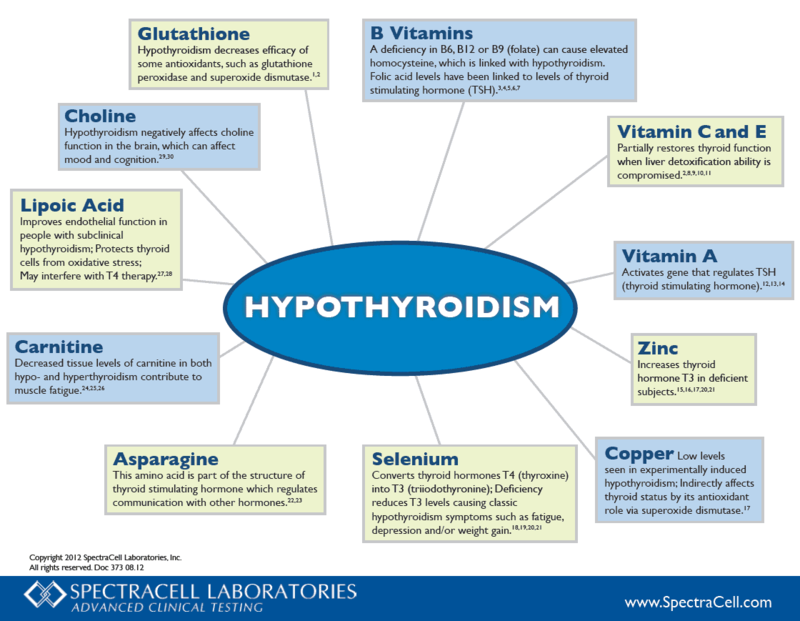 Paul Jaminet in his Perfect Health Diet says “Potassium is the intracellular electrolyte while sodium is the extracellular electrolyte. 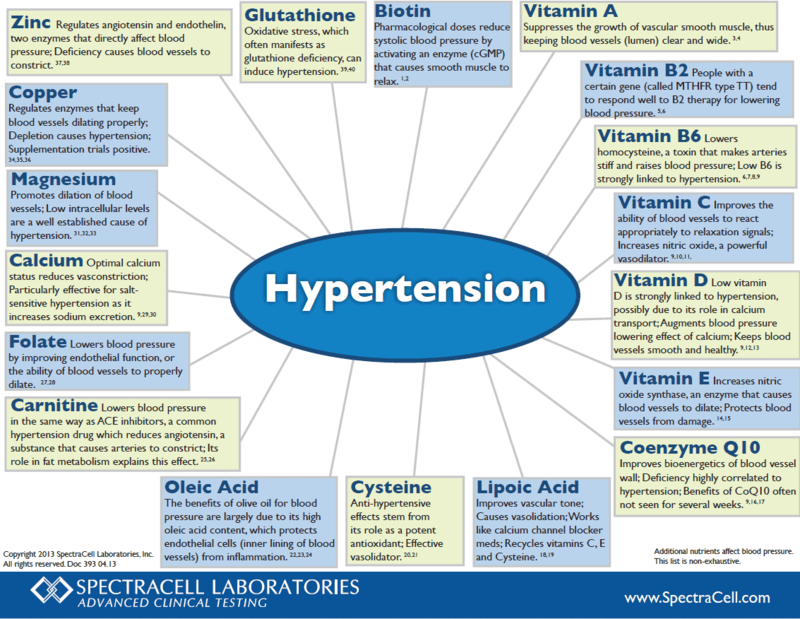 Cells continually pump sodium outside the cell and potassium inside. Good health depends on the proper dietary balance between potassium and sodium. While supplements can be helpful, obtaining nutrients from whole foods will also maximise your chance of absorption and increase your chance of getting all the necessary complementary micronutrients in adequate quantities without being excessive. Note: excess supplementation of minerals can quickly cause diarrhoea, or the kidneys will excrete excess nutrients from supplements. I have not included fortified foods that may score highly due to a narrow range of synthetic micronutrients that have been added to highly processed and sugar ladened products. Nutritious whole foods will provide you with not only the essential nutrients that we can quantify but all the other beneficial non-essential nutrients, phytonutrients, enzymes, and cofactors  that are not yet quantified or in the USDA database. Many people choose to base their food choices on moral convictions or religious beliefs. I do not have any issue with people making their food choices based on ethical considerations or religious beliefs. 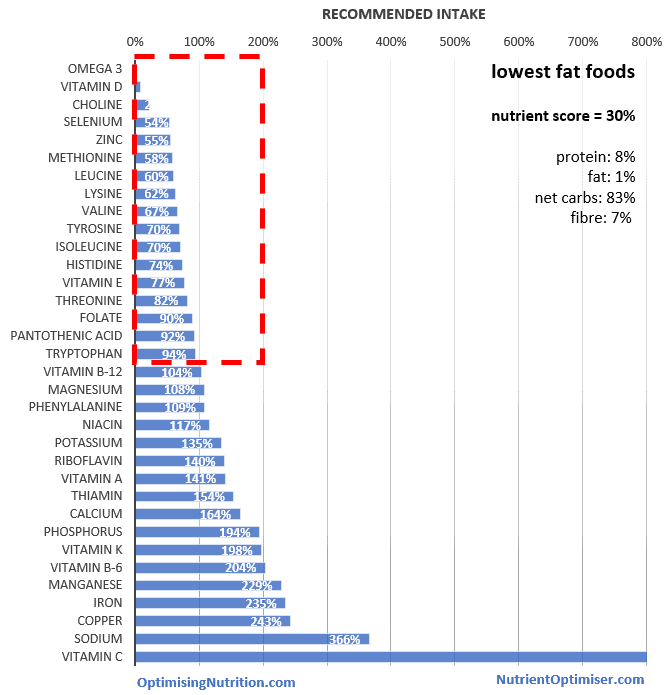 The lists in the table below will help you find the most nutrient dense foods associated with each of these approaches. The food lists have been sorted based on their nutrient score from highest to lowest at the bottom of the table. We achieve the most nutritious selection of foods when we focus purely on nutrients. If you chose to limit your food choices due to other ethical considerations, then you should pay particular attention to the foods that will provide you with more of the harder-to-find essential nutrients. In the long run, the goal is to get the nutrients we need from our food to enable us to thrive without over consuming energy. This will give us the best chance of maintaining an ideal body weight, energy levels, performance and avoid the modern diseases of ageing. Some people like to define their nutritional approach in terms of large or small quantities of a particular macronutrient (e.g. low carb, low fat, high protein, low protein, high or low saturated fat, etc.). 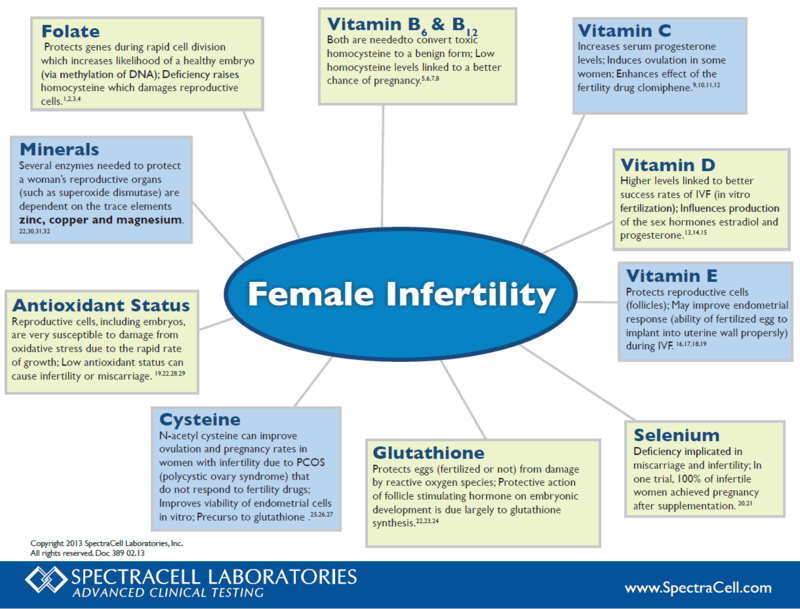 The analysis summarised in the table below shows the implication on the nutrients available if you follow any of these approaches. I think it’s useful to understand the pros and cons of these extremes, particularly in terms of the micronutrients available and the range of foods involved in any of these more extreme approaches. I hope you find an approach that will suit your current goals and situation and have a glimpse of how you can continue to move your health forward. 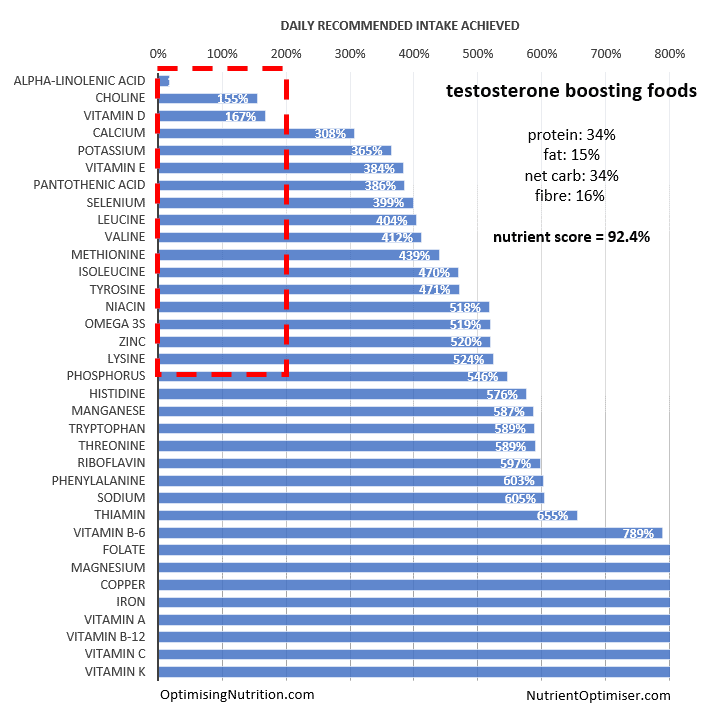 I have intentionally included a lot of data in these tables to allow you to fully understand the pros and cons of each approach and compare the nutritional options you might be interested in. 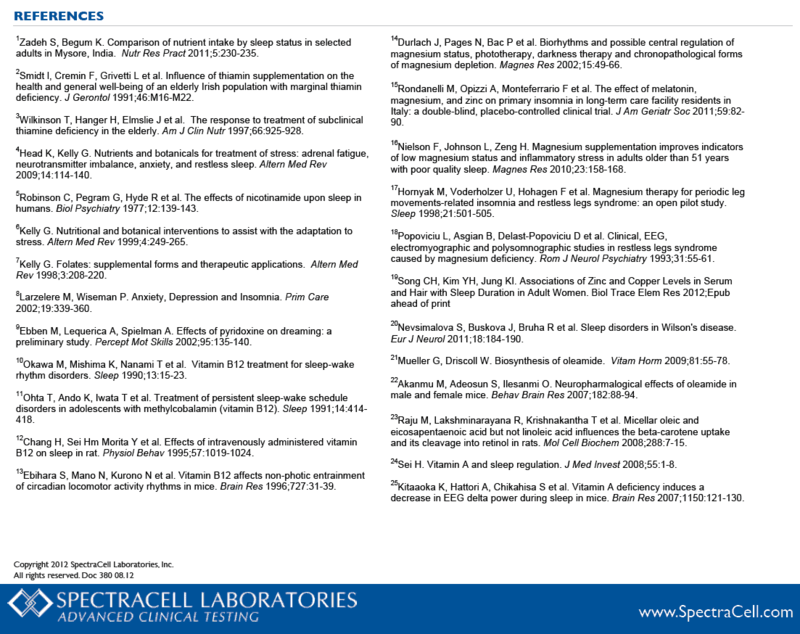 If you want to learn more about how these lists were developed I invite you to read on to learn about nutrient density, insulin load and energy density, and how they can be combined, using the Nutrient Optimiser algorithm to optimise our food choices. While there are a range of useful parameters that we can use to optimise our nutrition, the most important is arguably nutrient density. Nutrient density is simply the amount of nutrients per calorie or the amount of the essential nutrients you get in your food each day. 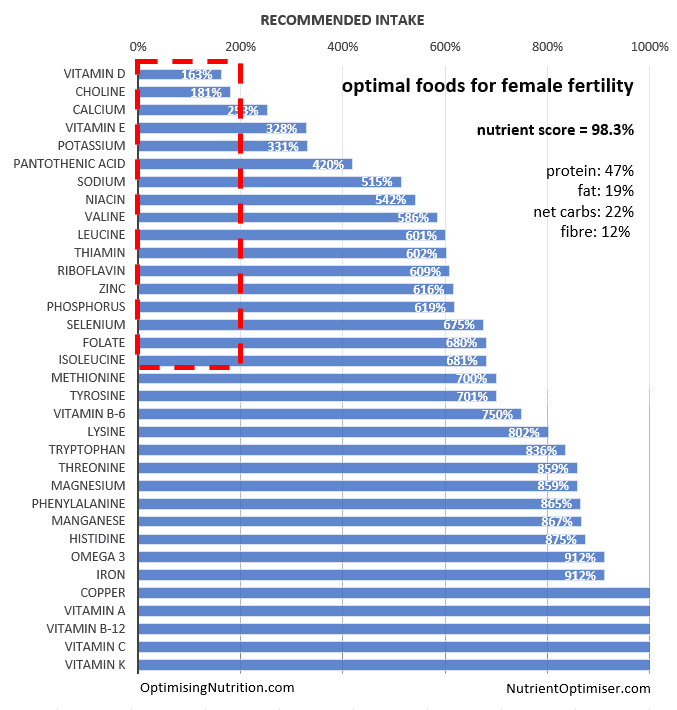 Ideally, we want to be meeting the daily recommended intake for all of the nutrients. 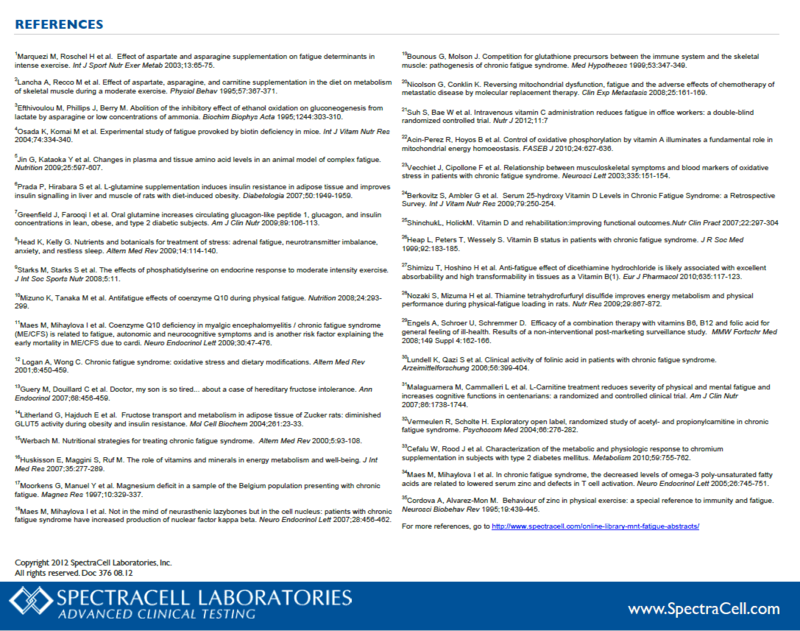 Micronutrients seem to have been largely overlooked in our current discussion about nutrition. 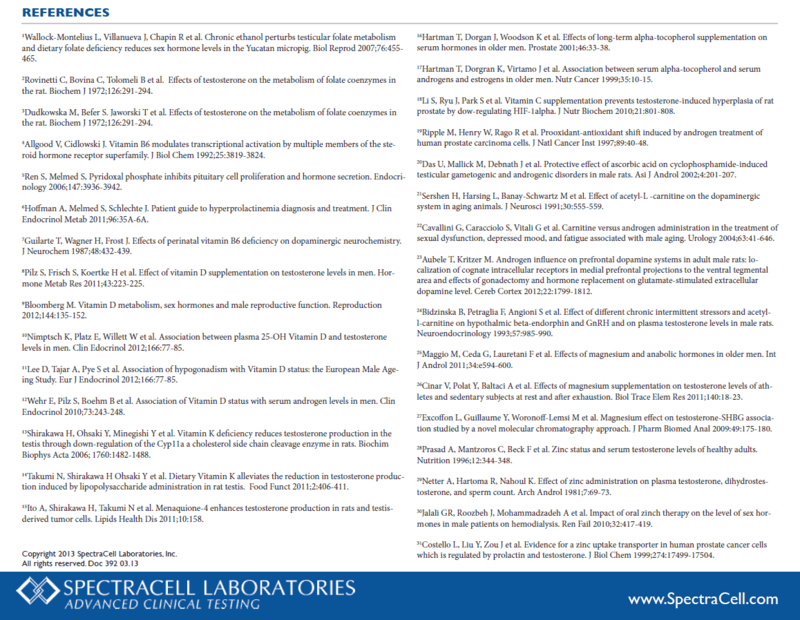 Perhaps this is because micronutrients are harder to quantify. 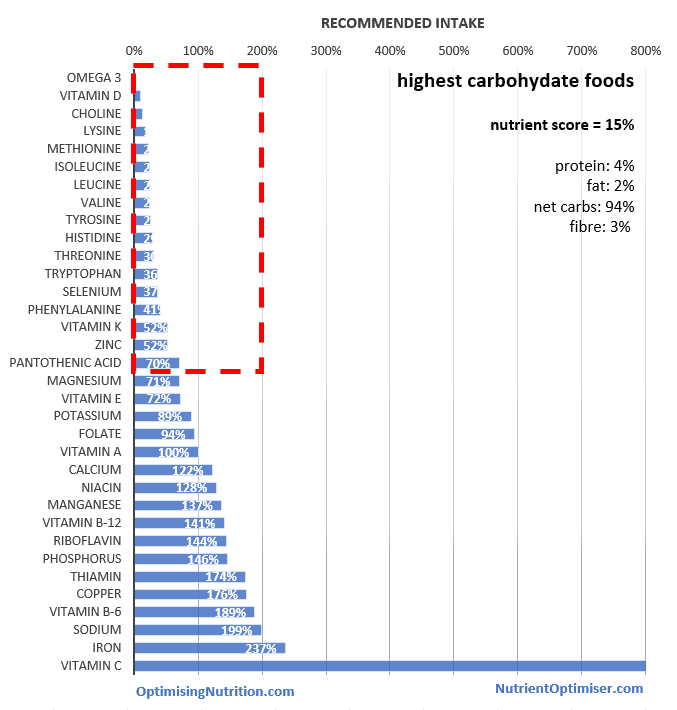 Without an easy way to quantify micronutrients we tend to focus on simpler metrics such as fat, carbs, saturated fat, protein, vegan, plant based, Paleo, keto, etc. 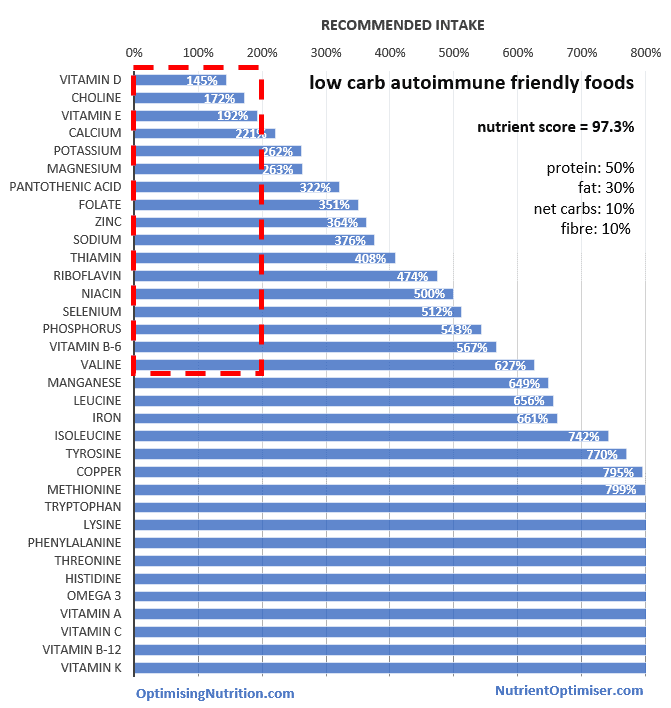 Unfortunately, neither avoiding a particular nutrient (saturated fat, salt, cholesterol, etc) or aiming for a macronutrient extremes (high fat, low fat, low carb, high carb, high fibre, low protein, etc) or even following our religious or ethical convictions (vegan, vegetarian, plant based etc ) are especially useful when it comes to identifying foods that provide us with the most micronutrients. But what if we could quantify the micronutrient content of the food we eat? 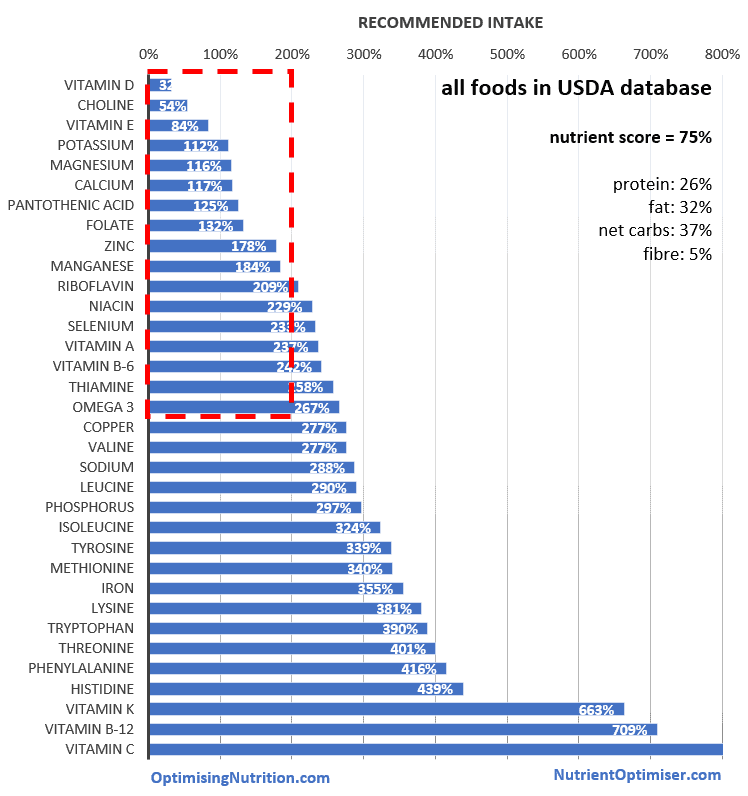 The graph below shows the average of the micronutrients in the eight thousand or so foods in the USDA food database as a proportion of the daily recommended daily intake (DRI). Imagine you ate just a little bit of all of these eight thousand foods to make up your 2000 calories for the day. 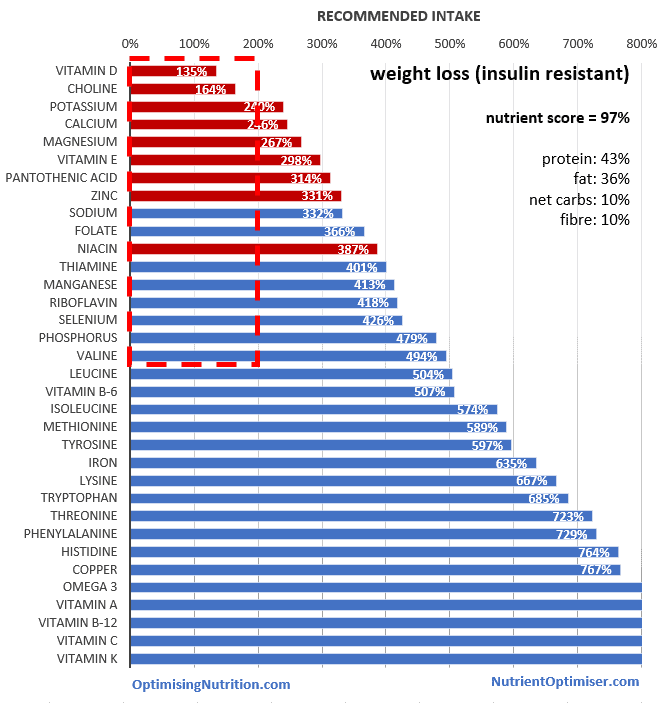 The nutrients at the bottom of this chart are easy to obtain in our food system (e.g. 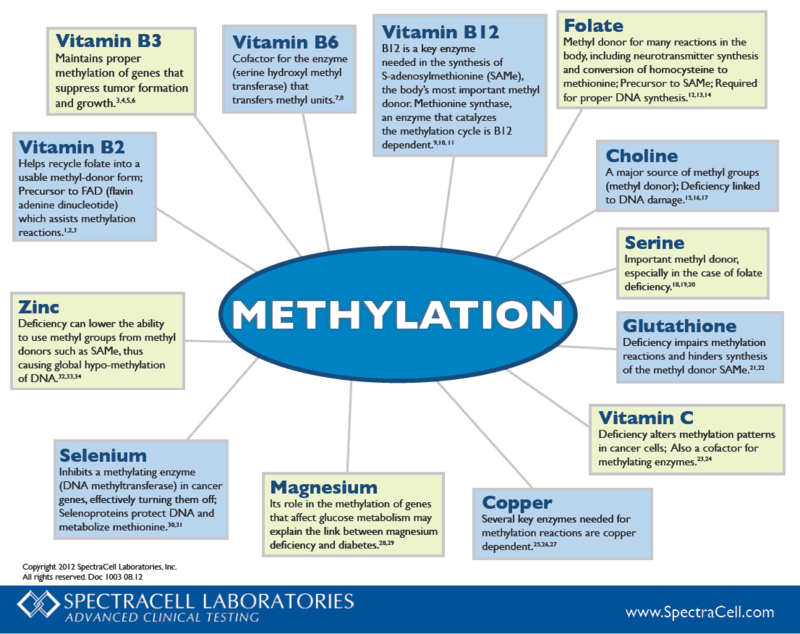 vitamin C, vitamin B12, vitamin K, and various amino acids). 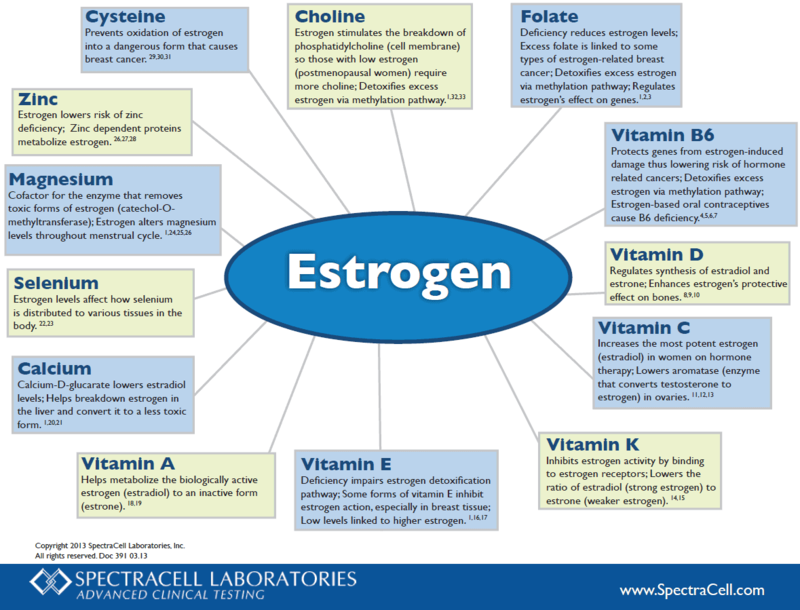 There is little need to worry about these easier to find nutrients. However, where this analysis is useful is that it highlights the nutrients that we might have to pay extra attention to obtaining in adequate quantities (e.g. 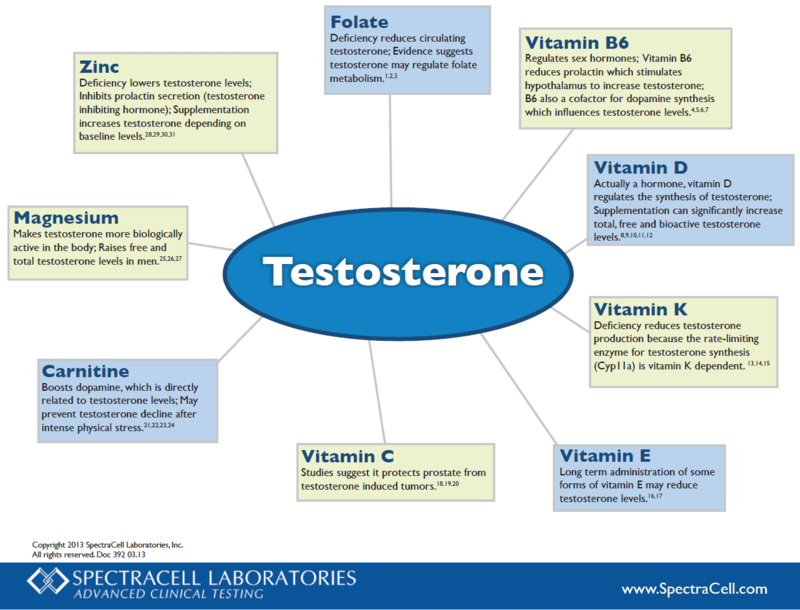 vitamin D, choline, vitamin E, potassium, magnesium, calcium, etc.). 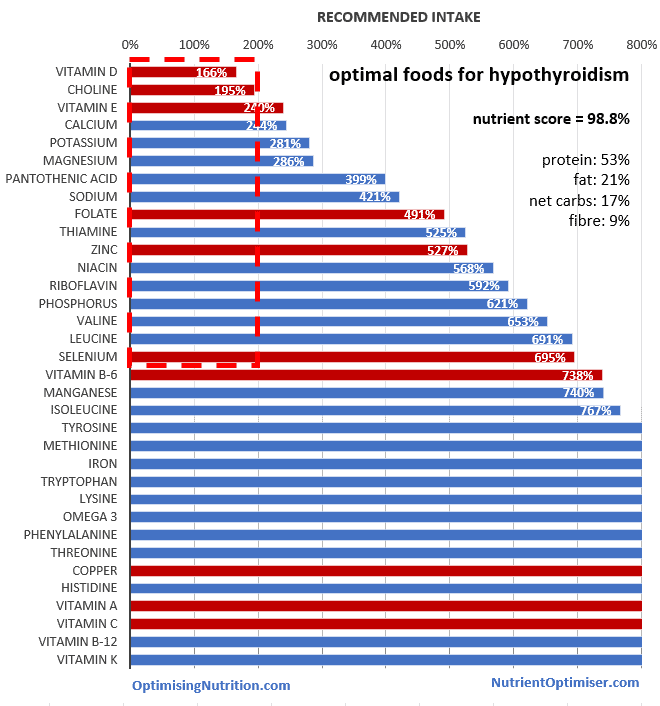 Prioritising foods that are high in only one nutrient (e.g. 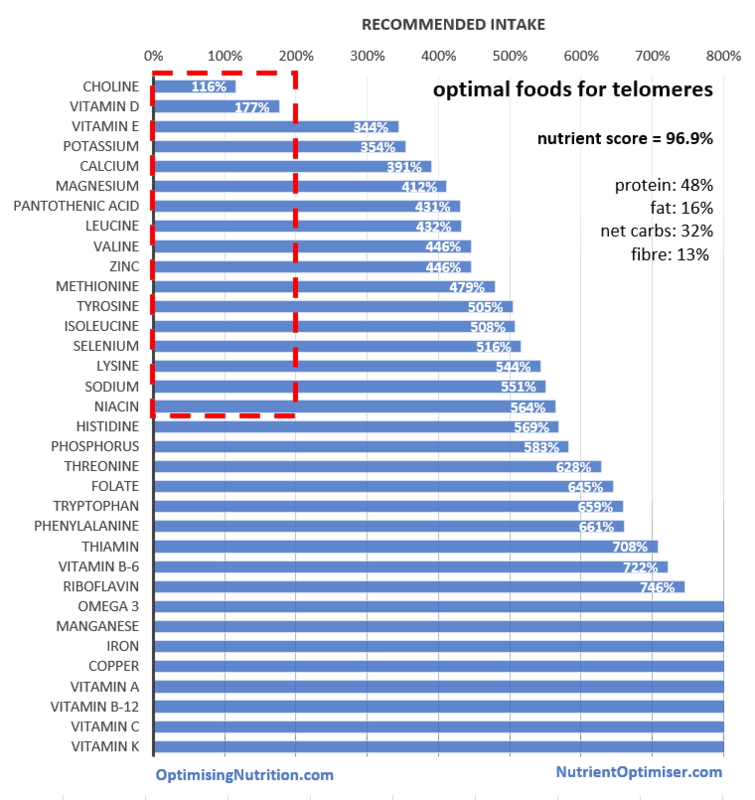 potassium, omega 3, magnesium, vitamin D, niacin, etc.) means you risk missing out on all the beneficial and complementary nutrients that typically come with real food and isn’t particularly useful. You usually come up with a range of obscure processed foods that have been supplemented with that nutrient. Focusing on maximising the quantity of all the essential nutrients gives us a VERY high protein list of foods. 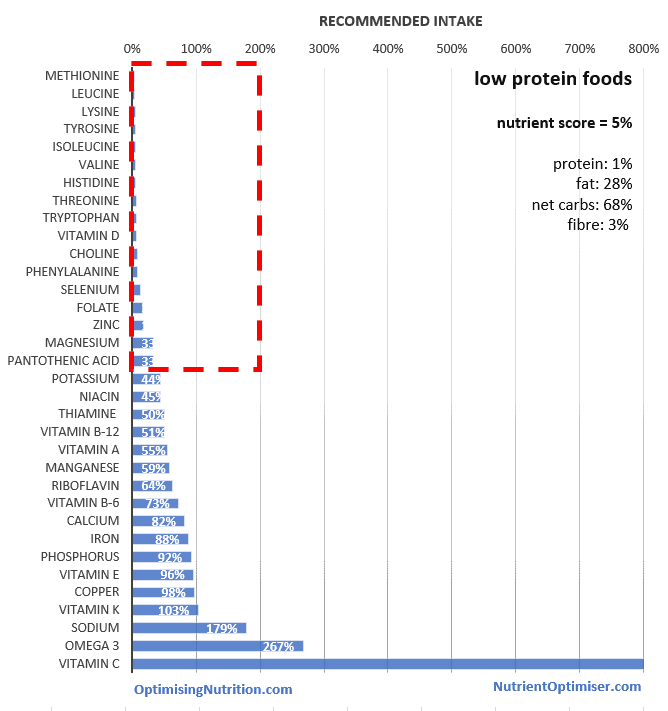 Protein is relatively easy to obtain in our food system. Prioritising the amino acids provides a list of foods that will be very hard to consume because they are 70% protein. 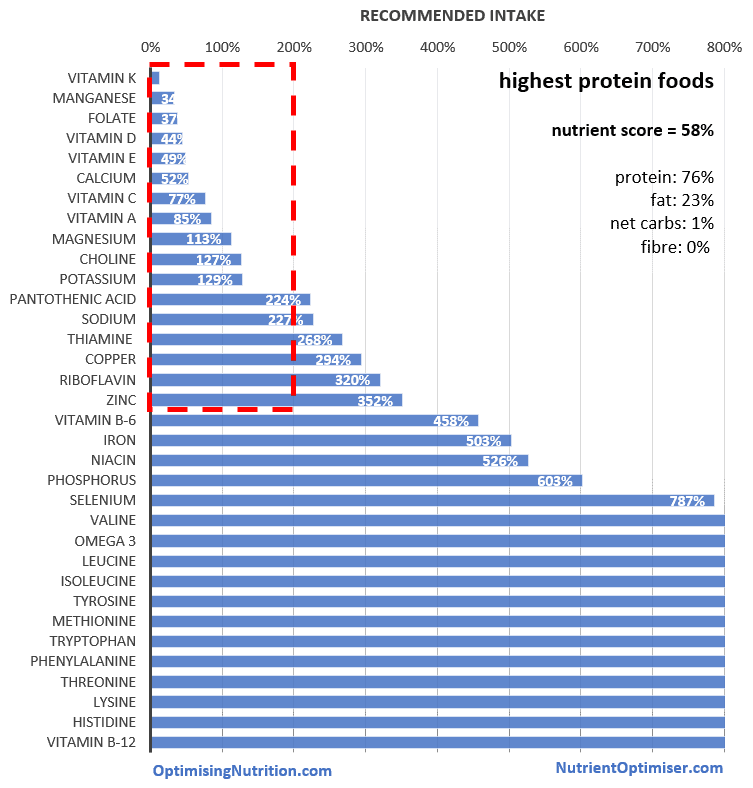 We tend to get more than enough protein when we focus on the harder-to-obtain vitamins and minerals. 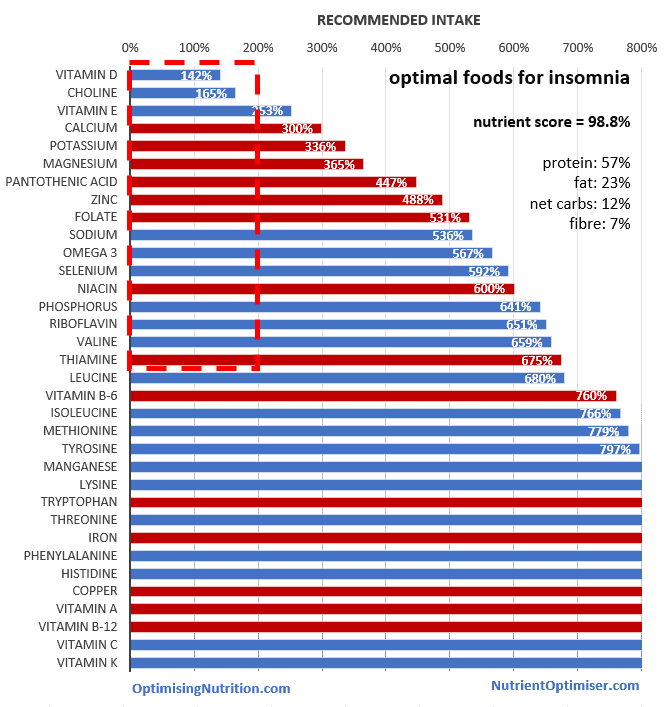 Using the Nutrient Optimiser we can focus on the foods that contain more of the nutrients that are harder to find. When we maximise a range of the harder-to-find nutrients, we get a variety of whole foods that contain a broad spectrum of the essential nutrients. 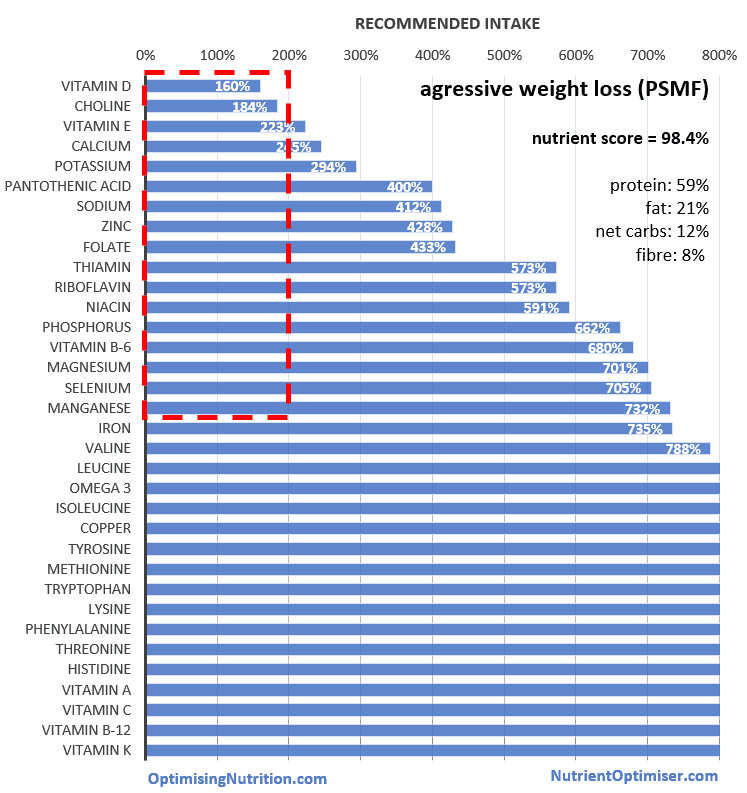 The chart below shows the nutrients provided by the top 10% of the foods in the USDA database when we prioritise for the harder-to-find nutrients. 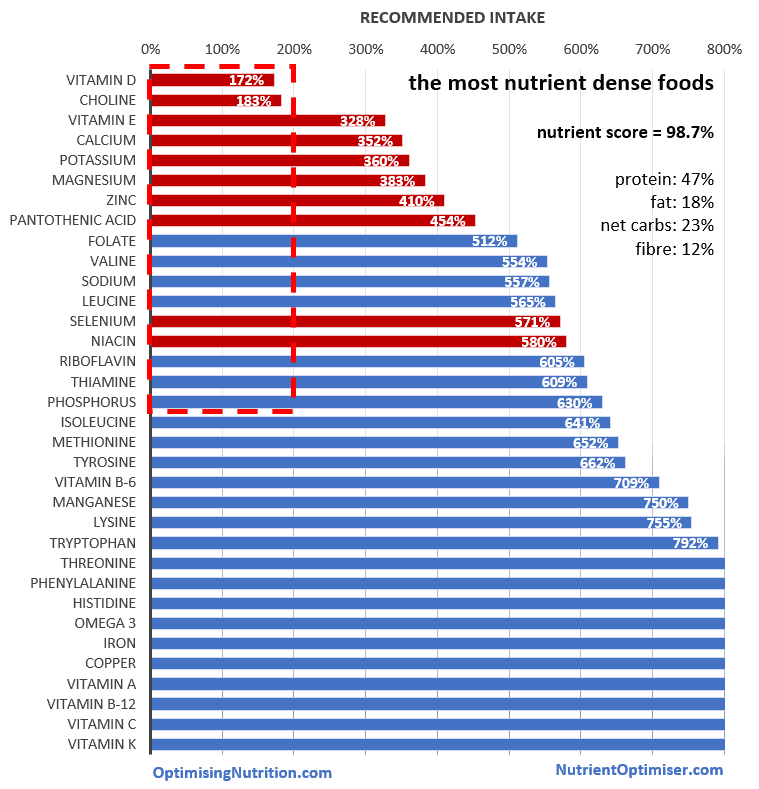 The red bars denote the nutrients that have been prioritised. 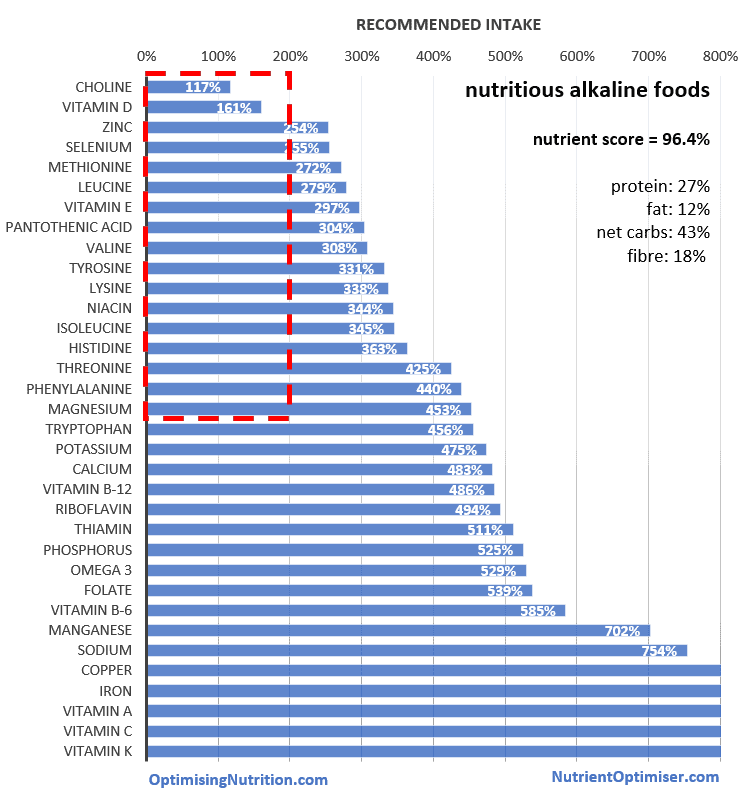 If you compare the chart below to the chart above, you will see that by focusing on the foods that contain harder-to-find nutrients we significantly boost all thirty-four essential nutrients! 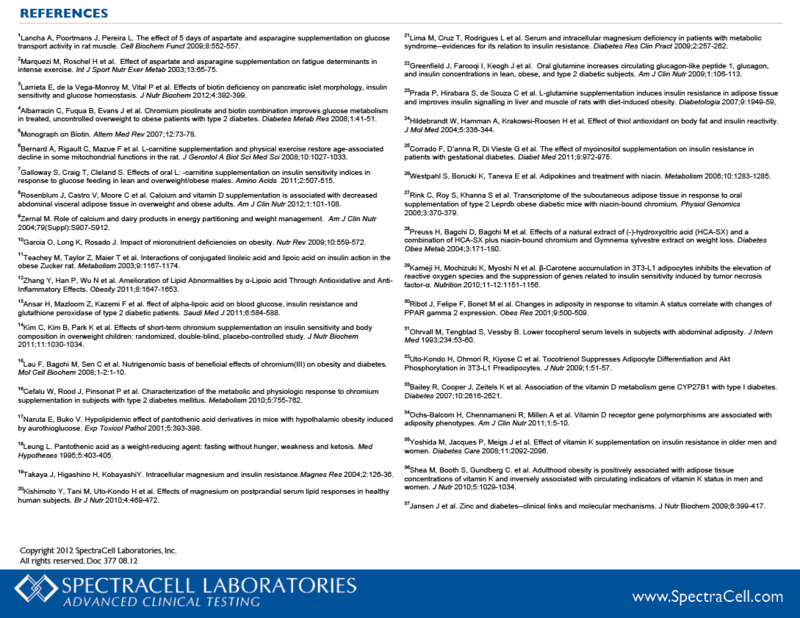 If you focus on eating foods in this list, you will have a good chance of getting plenty of the essential micronutrients. 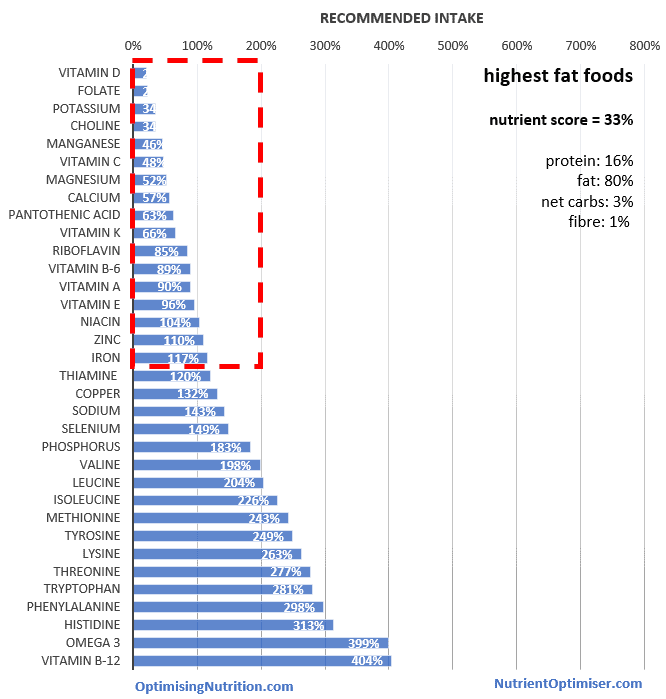 The most nutrient dense foods in each category are at the top of the list, so you would ideally focus more on the food at the top of the list as much as you could. I don’t think it matters too much if you want to focus more on more animal or plant based foods. But we tend to achieve the best nutritional outcome when we include a range of vegetables, animal products and seafood. Before the invention of agriculture, food processing and agriculture thee would have been times when plant-based foods were ‘easy pickings’ and others when we had to chase own our fat and protein with less high carbohydrate foods easily available. Starchy grains do not make the list due to their low nutrient density. Fruits also do not regularly feature in the lists (other than the exclusively plant based lists) due to the lower nutrients per calorie. Dairy and nuts make an appearance on the lists that are focused on managing blood sugars, but not where we prioritise keeping energy density low or to lose weight. Red meat tends to feature more prominently when we need to boost nutrients such as glycine, cysteine and glutamine which are not as prevalent in seafood. 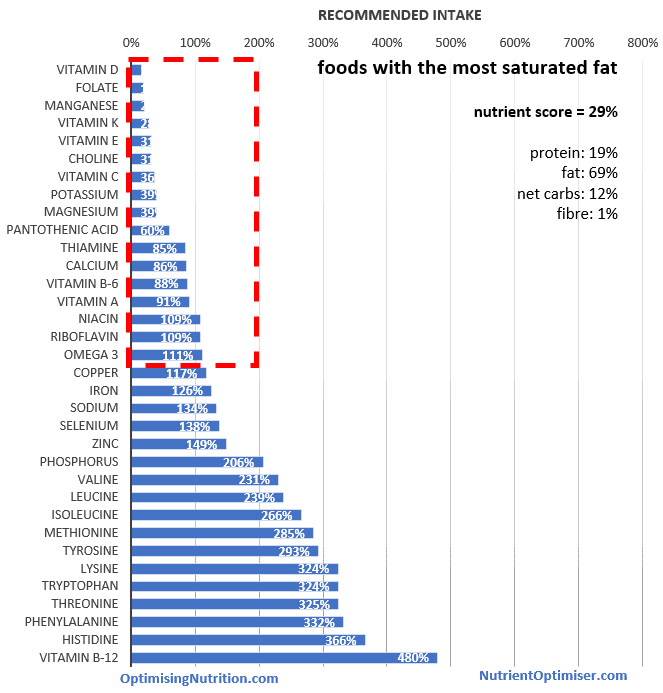 The “nutrient score” for the most nutrient dense foods is 98.7%. But what does this mean? 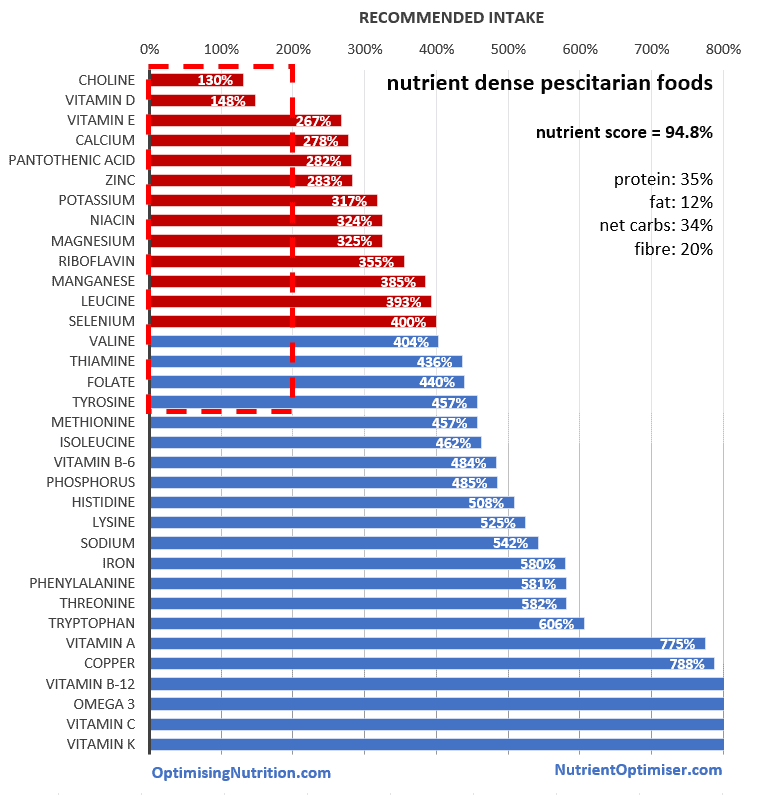 The nutrient score allows us to compare the various nutritional approaches quantitatively. We want to meet the daily recommended intake of a particular nutrient. However, there may not be much value getting more than twice the DRI. Once you’ve achieved two times the DRI your efforts would be best spent seeking out other nutrients. If we achieved two times the recommended daily intake for all the nutrients, we would get a score of 100%. That is, we get a perfect score if the entire red rectangle was filled in. 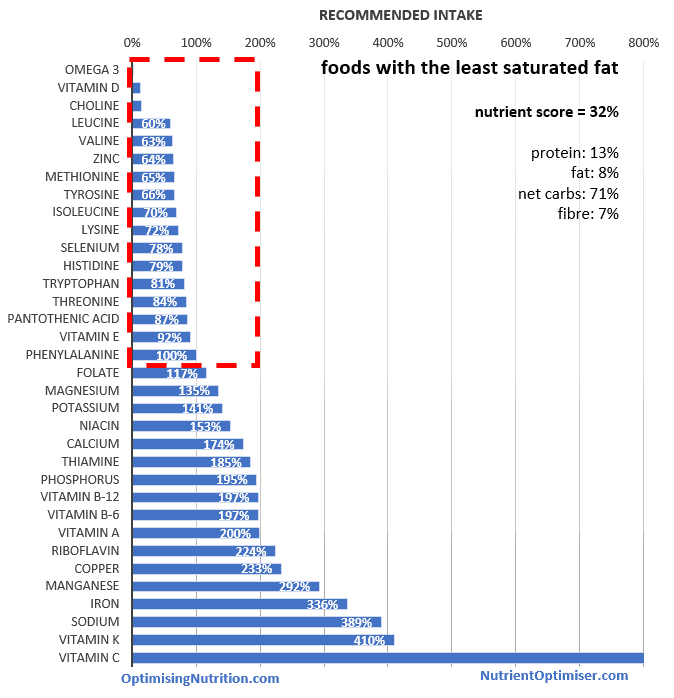 A lot of these food lists score close to a perfect score because they contain a range of the most nutrient dense foods. This is not practical in real life. 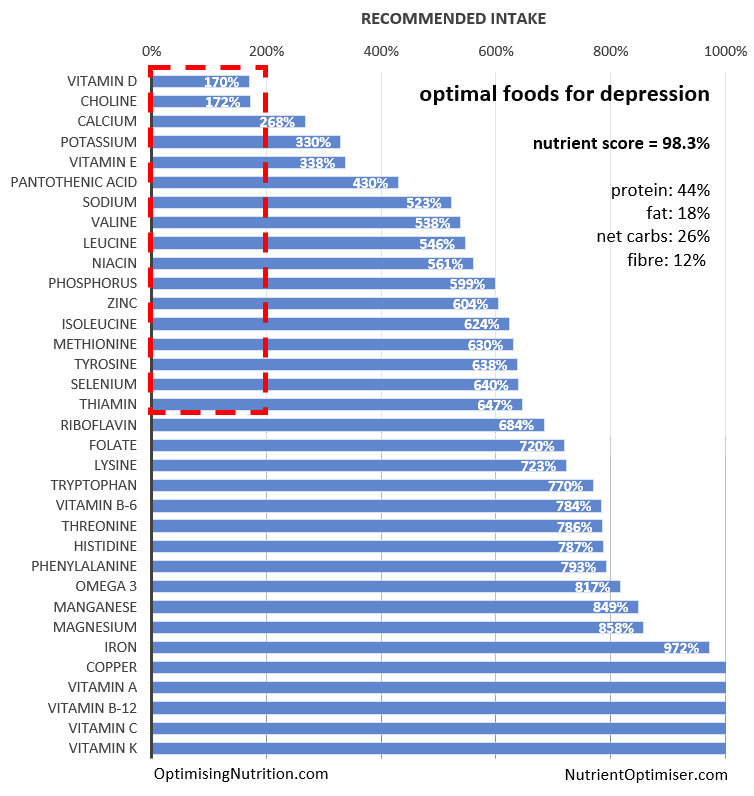 The nutrient score of a real life diet will be lower than the optimised short list of nutrient dense foods. We tend to choose more energy dense foods that may not be as nutrient dense, or we don’t consume the range of foods that would be necessary to attain a very high nutrient score. 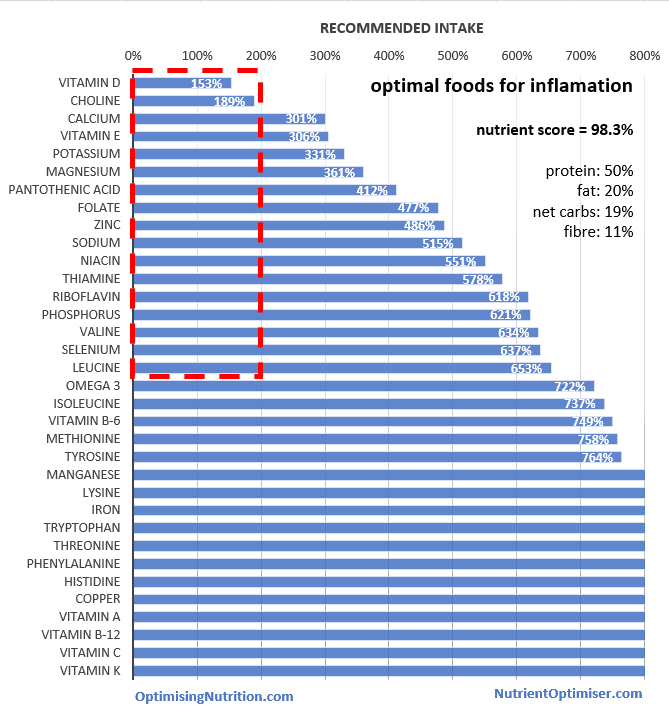 We can see from the chart below that focusing on the least nutrient dense foods will provide an inferior outcome. If all we have to eat is these nutrient poor foods, we will likely develop nutrient deficiencies. Our cravings will drive our appetite to derail even our best calorie restriction intentions. 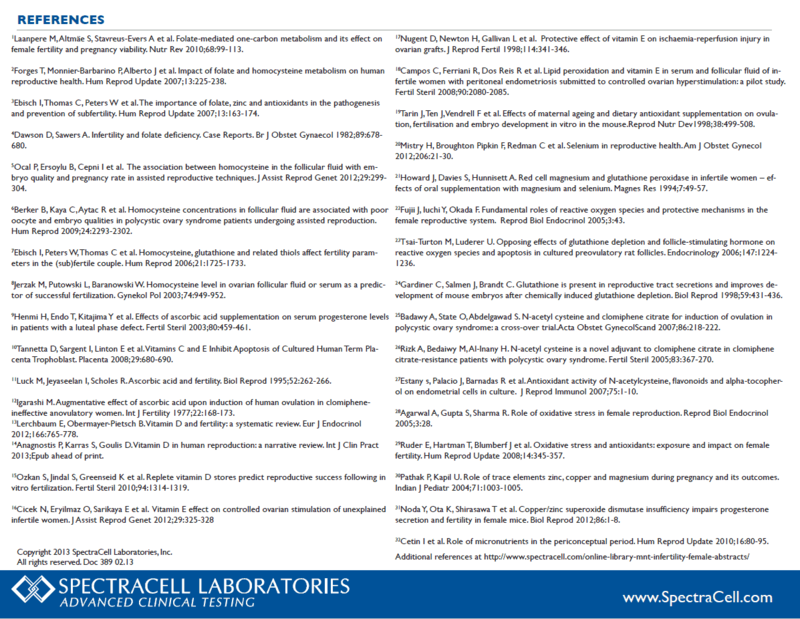 Check out the Nutrient Optimiser Leaderboard to check out what real life nutrient profiles look like. The great thing about nutrient dense whole foods is that they force out the energy dense processed foods in our diet. Whether it be low carb, whole food plant based or Paleo, the magic happens when we exchange out nutrient deficient foods for foods that provide you with the nutrients we need with less energy. 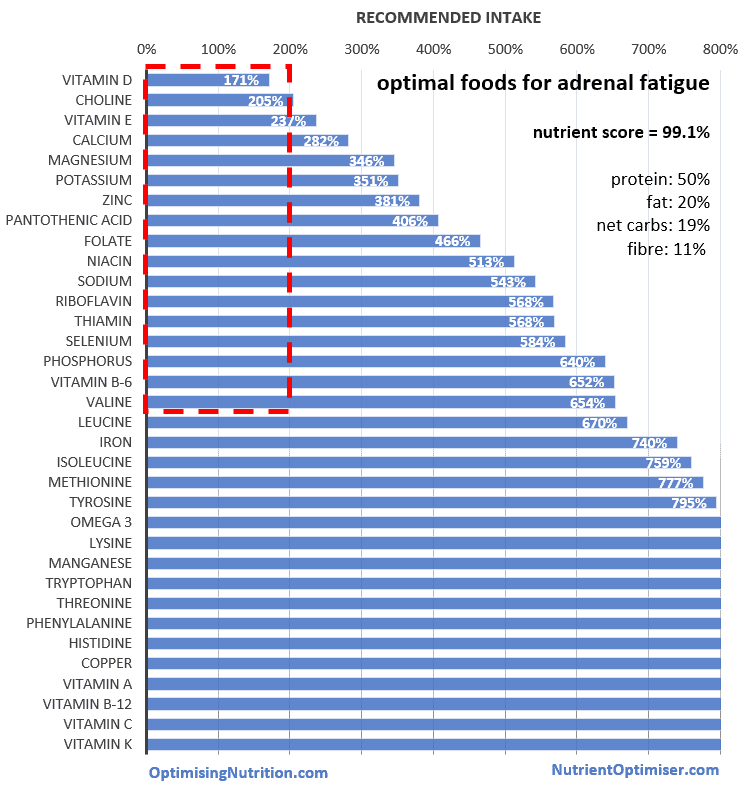 The ‘problem’ however with nutrient-dense whole foods is that they make it hard to ingest enough energy. If you are active and are not wanting to lose weight, you may need some higher energy density foods. Over at KetoGains, they talk about using ‘fat as a lever’. If you are not worried about being low carb or ketogenic or your blood sugar control, you can also think of ‘energy density as a lever’ to manage the amount of energy you can get from your diet. 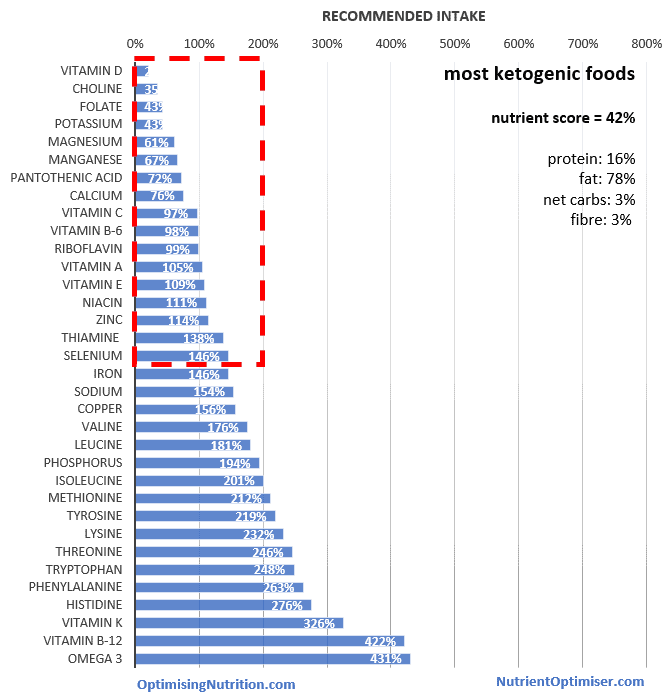 While a ketogenic diet is typically higher fat, if you want to lose body fat then some of the fat contribution to your diet should come from your body, with less fat required from your plate or coffee mug. Energy density is a simple concept that can help you fine tune your food choices and is calculated by dividing the calories in a food by its weight. 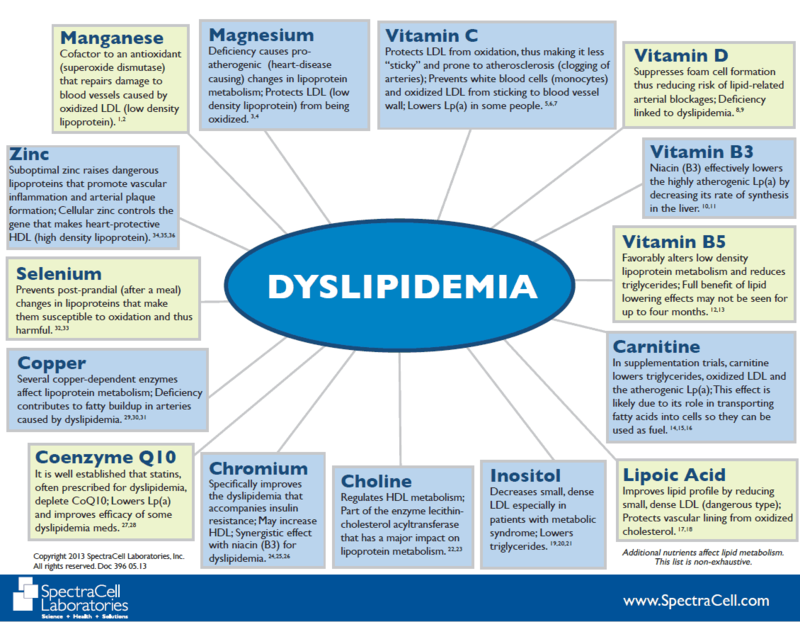 Used in isolation it isn’t particularly useful, but can be helpful whne considered along with nutrient density once you have stabilised your blood sugars by tweaking the insulin load of the food you eat. If you have stabilised your blood sugars and are trying to lose weight, then minimising the energy density of the foods you eat will help you feel physically full with less energy intake. Practically this might involve filling up on more nonstarchy veggies and perhaps leaner cuts of meat. Focusing on foods with a lower energy density can help you to get the nutrients you need without overdoing the energy intake. 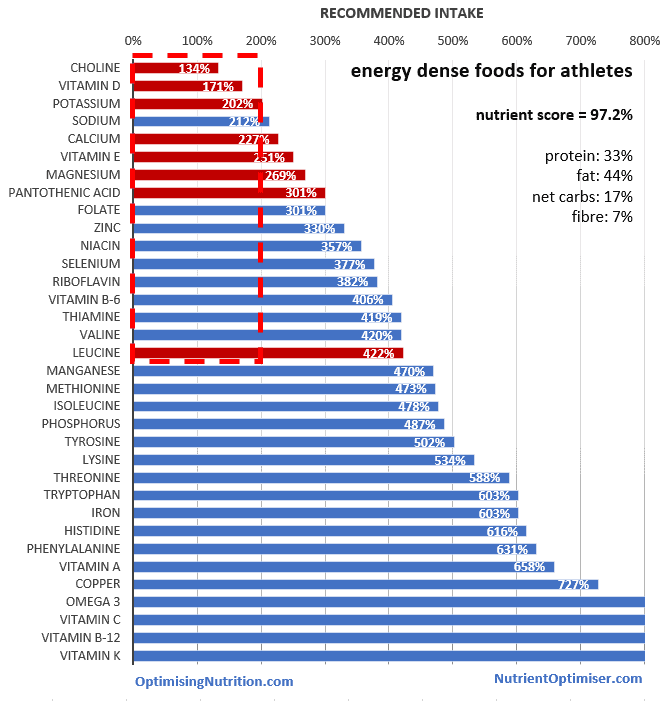 Alternatively, if you are an athlete and need to ingest a lot of fuel, then focusing on higher energy density foods may be helpful. However, carbohydrates alone don’t do a great job of explaining our insulin response to the food we eat. As you can see in the chart below, some high protein, low carb foods still elicit a significant insulin response. We get a much better prediction of our insulin response to food once we account for the fibre and protein content of our food. Thinking in terms of insulin load (i.e. net carbs + 0.56 x protein) is useful if you are manually injecting insulin to manage your diabetes. If you are insulin resistant, you can reduce the insulin load of your diet to the point that your pancreas can keep up and maintain normal blood sugars. Reducing the insulin load of your diet will help achieve more stable blood sugar levels and get off the insulin rollercoaster that drives hunger and energy levels. While various studies have not been able to demonstrate a metabolic advantage of one macronutrient versus another, it seems that appetite control is easier for people who are insulin resistant when they manipulate their diet to stabilise their blood sugars. While too much energy from any source can promote insulin resistance in the long run (note: the pancreas secretes insulin to stop the flow of energy out of the liver when we have plenty of energy coming in via the mouth), increasing the proportion of fat in your diet will lessen the amount of insulin required by your food. Increasing the percentage of calories from fat in your diet will also reduce your glucose response to food. Although protein does need some insulin to metabolise, higher protein foods will typically force out the processed carbohydrates and reduce your insulin levels. If you are part of the 50% of the population that has diabetes or prediabetes, then manipulating the insulin load of your diet will help you stabilise your blood sugar levels. This is a critical priority. 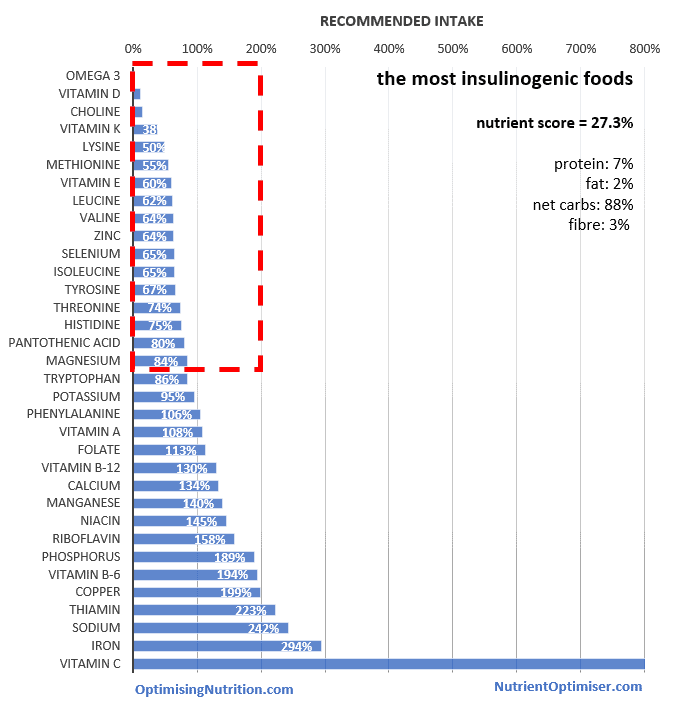 The problem with focusing only on insulin load, however, is that the least insulinogenic foods are primarily refined fats (cream, butter, olive oil, etc.) and do not contain a lot of the essential vitamins, minerals, and amino acids that we need to thrive and be metabolically healthy. The solution is to find the optimal balance between insulin load and nutrient density. As your blood glucose levels start to improve you can start to focus more on nutrient density and then on reducing energy density if you still need to lose weight. The various food lists have been developed using a multi-criteria analysis algorithm that uses nutrient density, energy density and insulin load to highlight the ideal foods for a particular person. The table below outlines the pros and cons of each of the higher level nutritional approaches, who they will be appropriate for and which nutrients are harder to find. 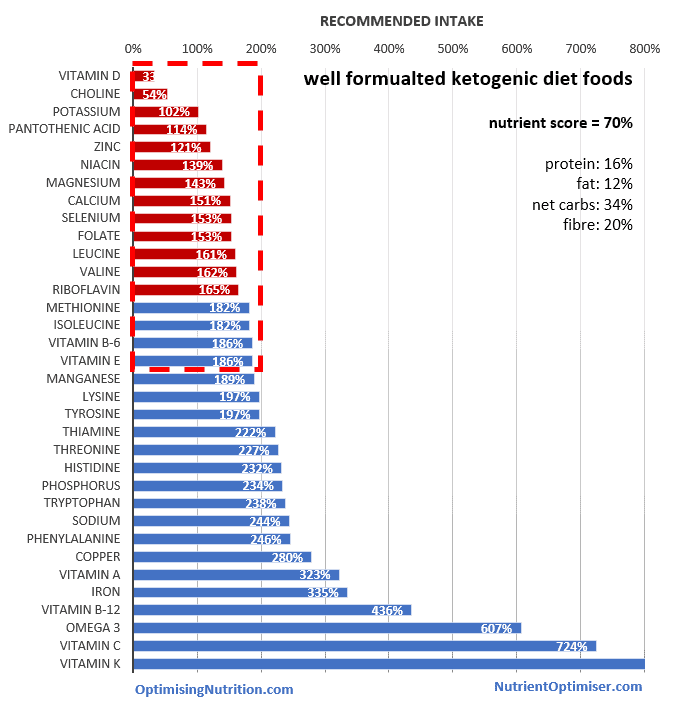 well-formulated ketogenic diet Someone with an average blood sugar greater than 140 mg/dL or 7.8mmol/L or people who require therapeutic ketosis (i.e. 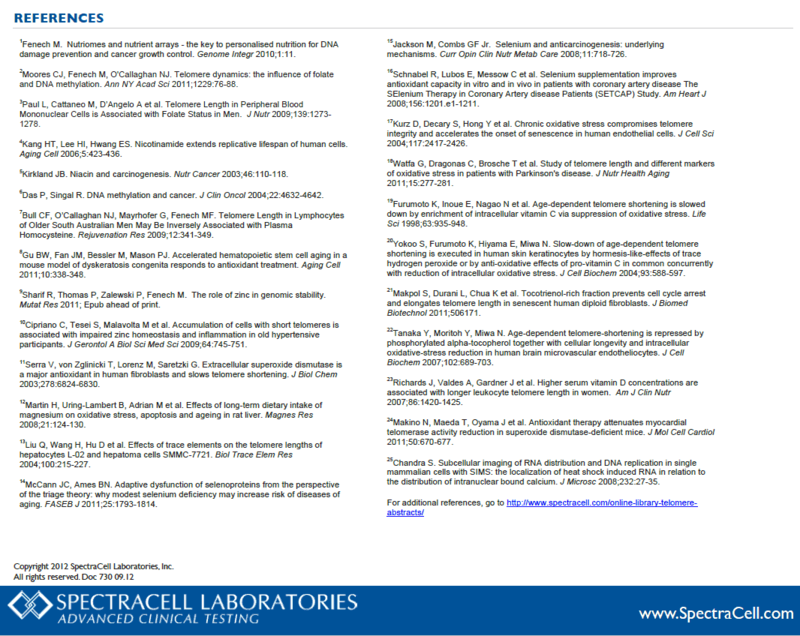 for the management of conditions such as epilepsy, cancer, Alzheimer’s, etc.) Vitamin D, choline, potassium, vitamin B5, zinc, niacin, magnesium, calcium selenium and folate. Aggressively lowers insulin load to stabilise blood sugars and drive ketogenesis. Higher fat levels can help to increase satiety while in early adoption phase. High energy density and low nutrient density mean that it may not yield optimal weight loss or health in the long term for everyone. 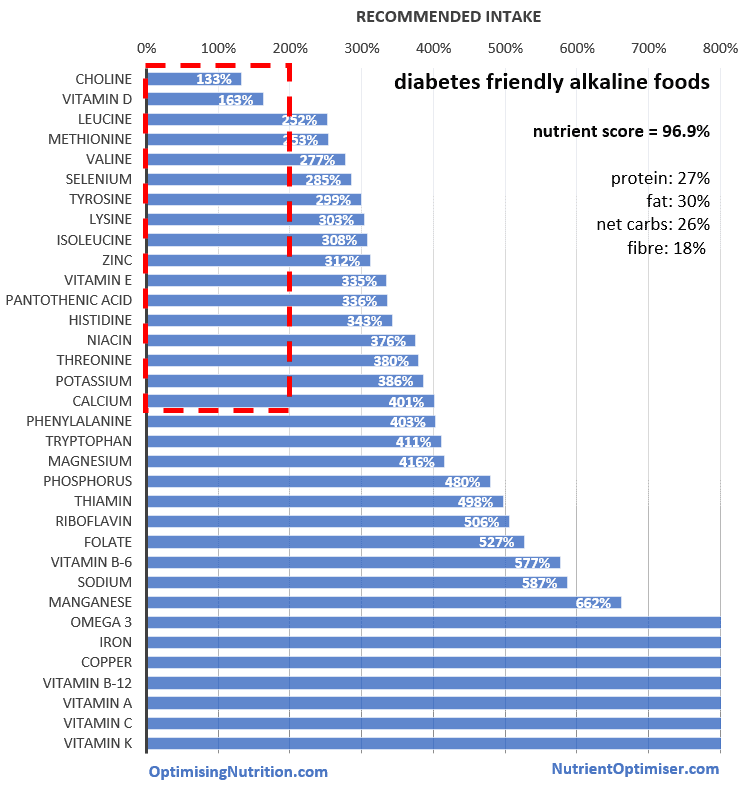 diabetes and nutritional ketosis People with an average blood sugar of greater than 108 mg/dL or 6.0mmol/L. 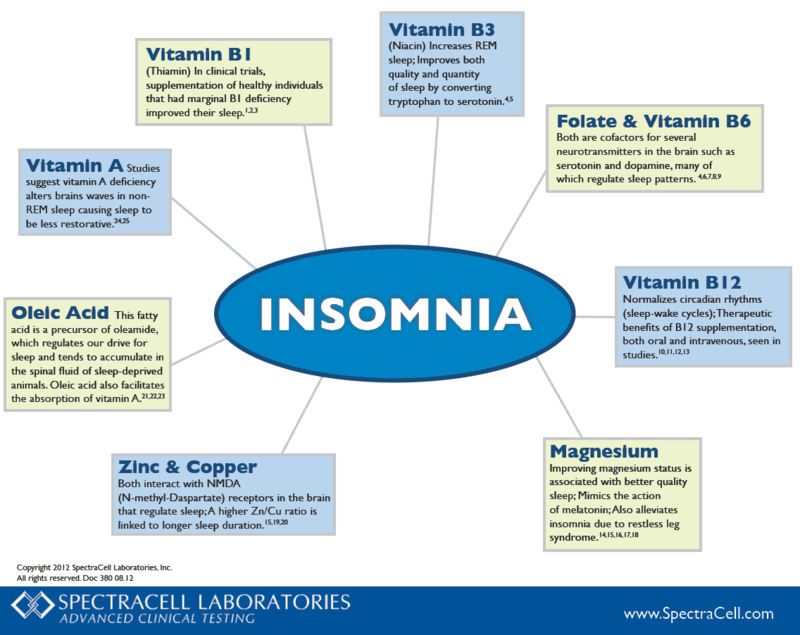 Choline, vitamin D, vitamin E, potassium, magnesium, vitamin B5, niacin, calcium and zinc. Helps optimise blood sugar control and eliminate the swings that can drive appetite. Higher energy density means that not everyone will achieve optimal weight without also focussing on energy density. 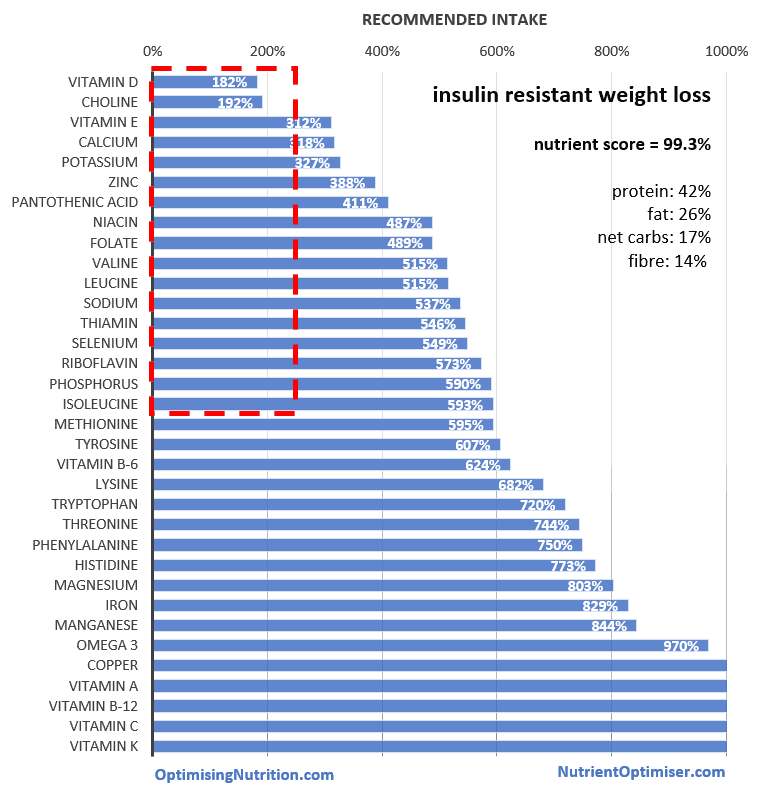 weight loss (insulin resistant) People who are slightly insulin resistant but want to lose weight. 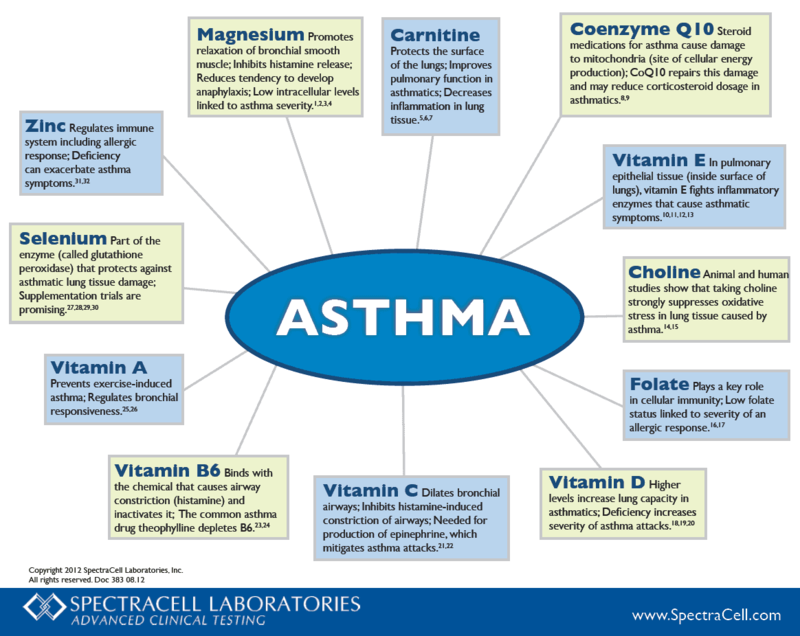 Vitamin D, choline, potassium, calcium, magnesium, vitamin E, zinc, niacin. Lower energy density will help ensure a reduction in energy intake. Higher nutrient density will reduce cravings. Lower satiety due to lower energy intake. 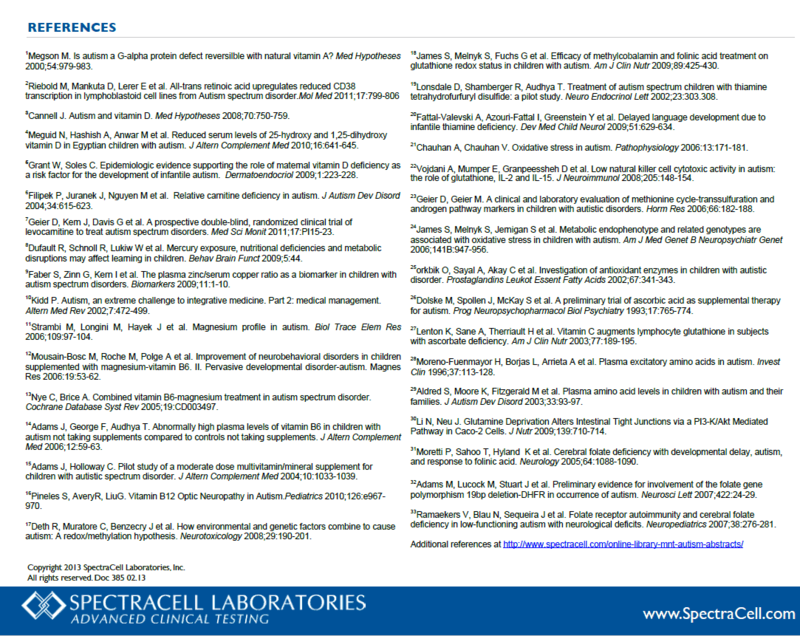 protein-sparing modified fast (PSMF) Someone targeting aggressive short term weight loss while maintaining muscle mass. 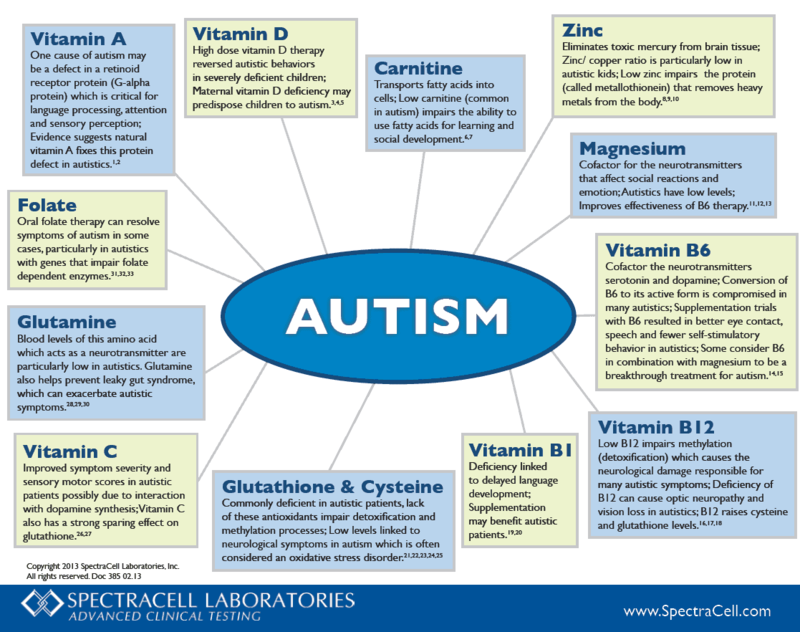 Vitamin D, choline, vitamin E, calcium, potassium, magnesium, zinc. Very nutrient dense and very low energy density will drive weight loss. Very hard to overeat these foods. Significant discipline, racking and planning required. nutrient dense maintenance Someone looking to maintain their current weight. 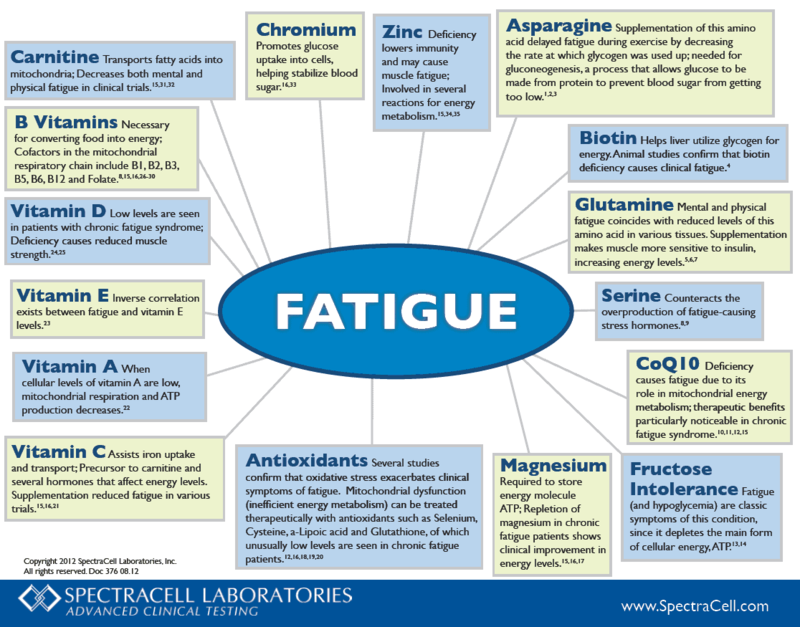 Choline, vitamin D, potassium, calcium, magnesium, zinc. Higher energy density while still being nutrient dense. bodybuilder Someone looking to repair and build muscle. Vitamin D, choline, potassium, calcium, magnesium, vitamin E, sodium, vitamin B5, zinc, folate and branched chain amino acids Support muscle growth. Not ideal for someone not working out. endurance athlete Someone who is active Choline, vitamin D, potassium, calcium vitamin E, magnesium, vitamin B5 and leucine. Higher energy density foods to support activity. 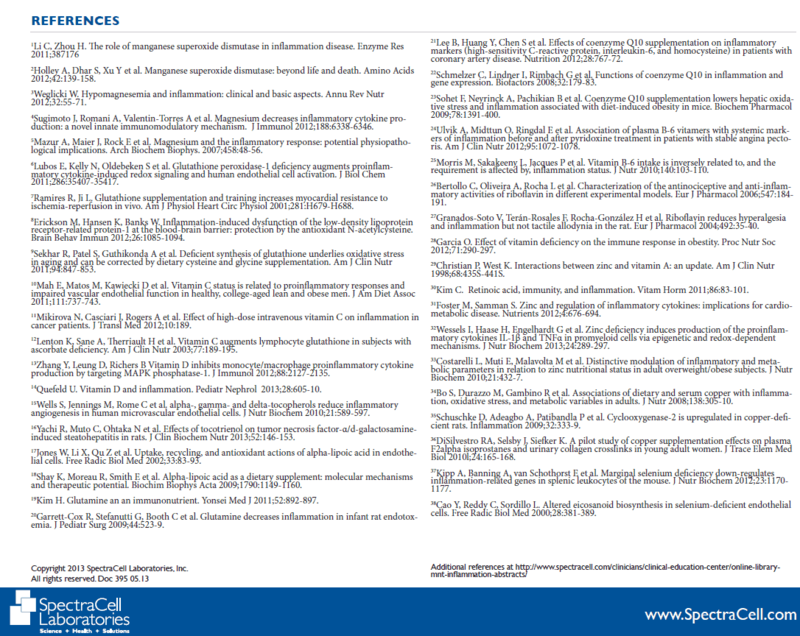 The table summarises the assumptions used in developing the lists based on religious, ethical or philosophical considerations and provides some brief commentary for each nutritional approach. 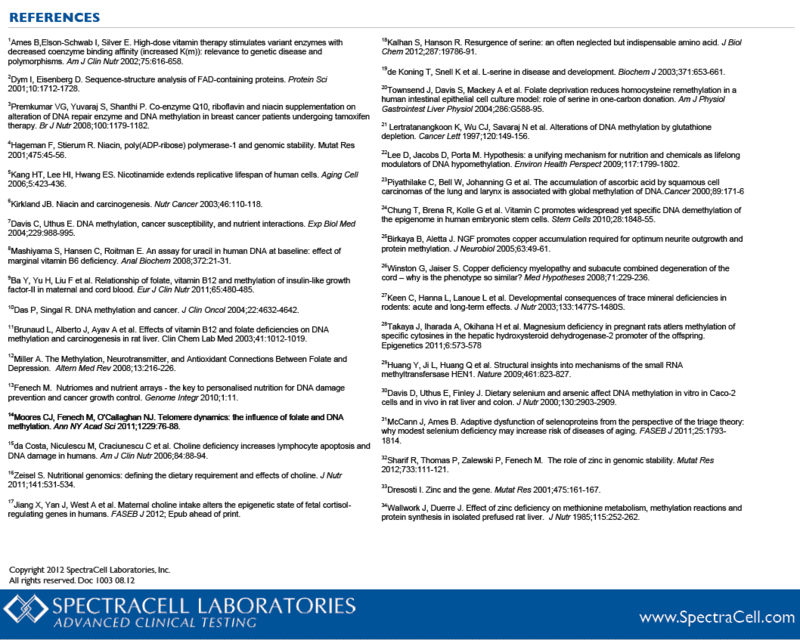 I encourage you to look in more detail at the data to better understand your preferred approaches. the most nutrient dense foods 100% Prioritises the harder to find nutrients. Maximises nutrients per calorie. 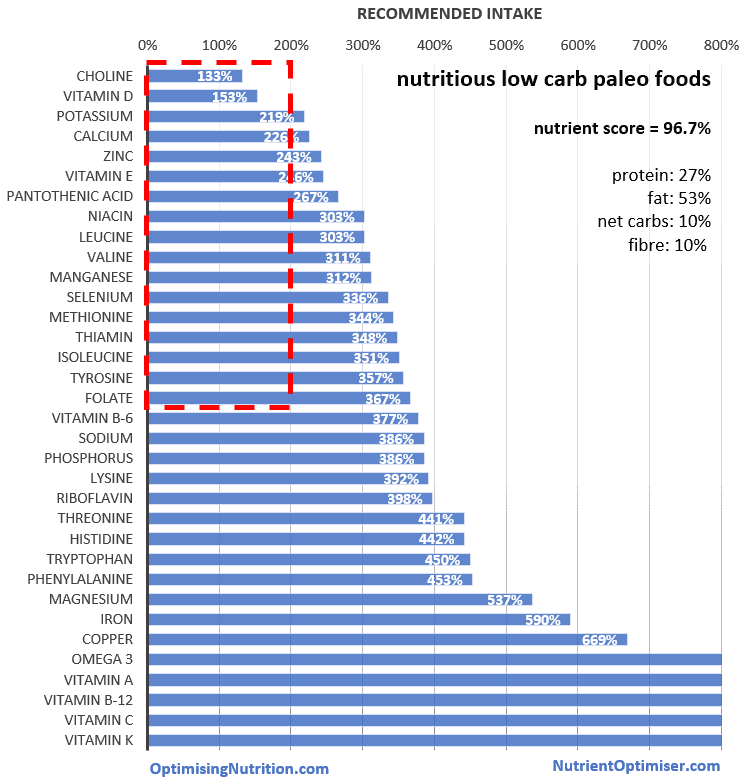 nutrient dense Paleo 99% Excludes dairy, grains and processed foods as well as prioritising nutrient density. 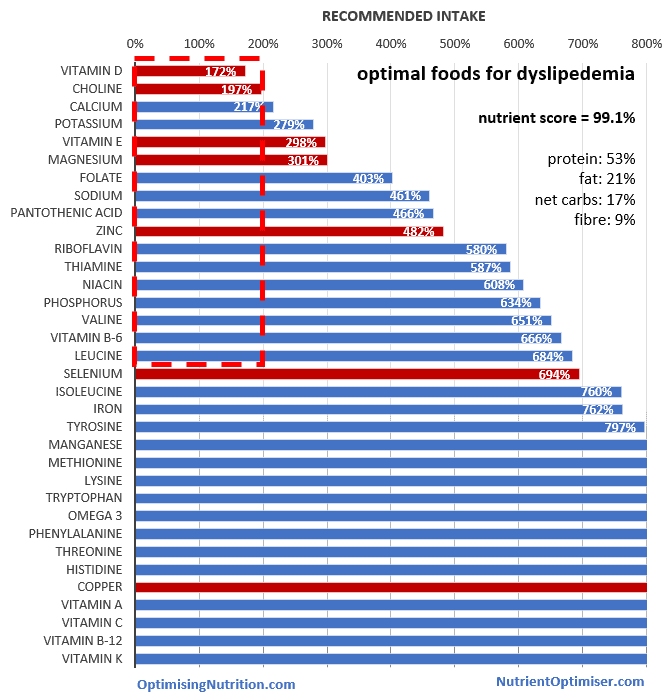 Very similar outcome to most nutrient dense approach, though with a reduced range of foods. low carb Paleo foods 97% Reduced insulin load to stabilise blood sugars while also maximising nutrient density. 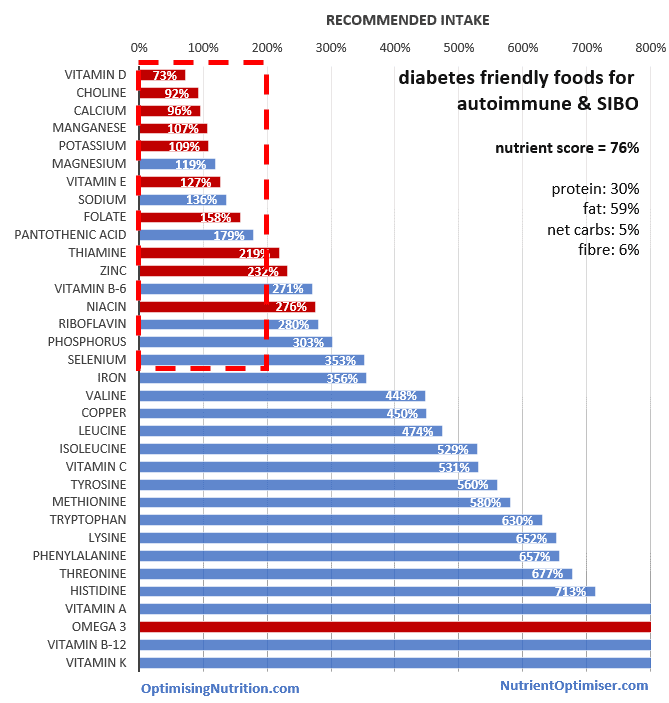 Will stabilise blood sugars more than straight Paleo which can involve more high carb veggies. 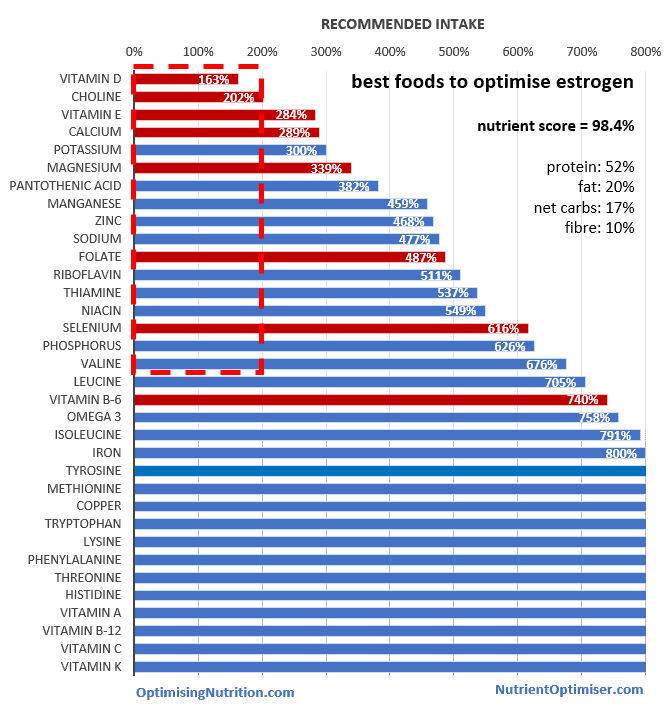 pescetarian 95% Plant based plus fish prioritised for nutrient density. Some vegans or vegetarians are comfortable eating fish. 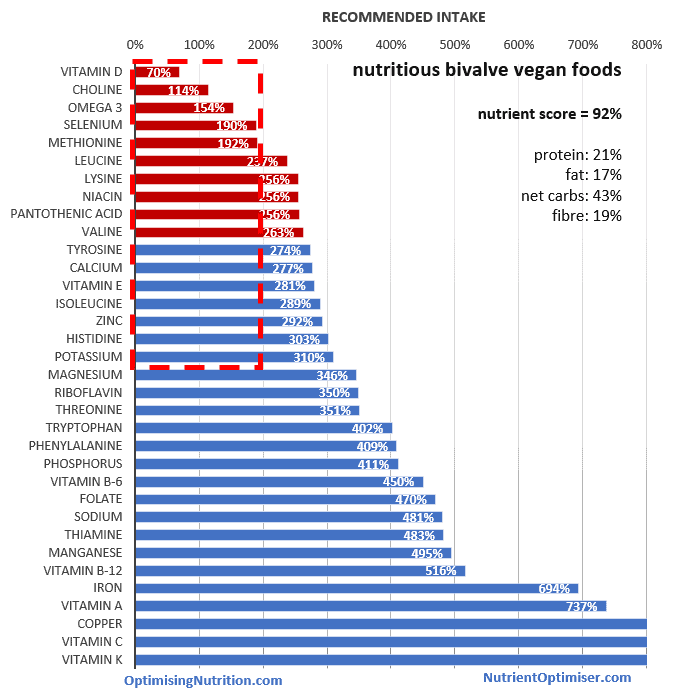 bivalve vegan 92% Plant based plus molluscs prioritised for nutrient density. Provides some nutrients that are harder to find on a purely plant based approach (omega 3, vitamin B12). Some vegans are comfortable eating molluscs which are not considered by some to be sentient beings. low carb pescetarian 95% Vegetarian plus fish with a focus on nutrient density and a lower insulin load. 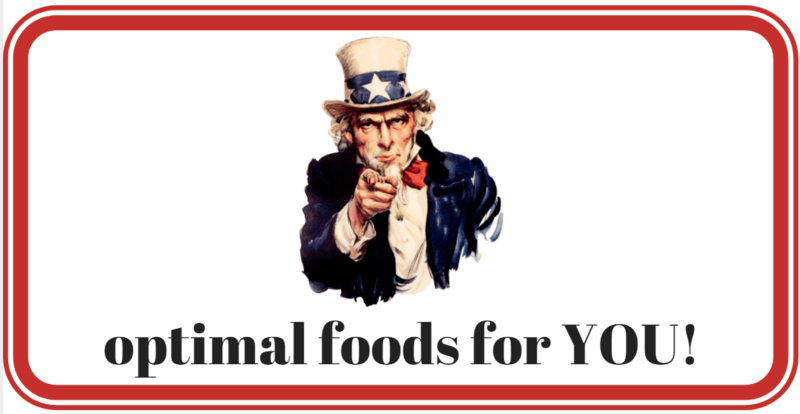 Provides a solid nutritional outcome without eating animals or dairy. whole food plant based 80% Excludes processed foods and oils. 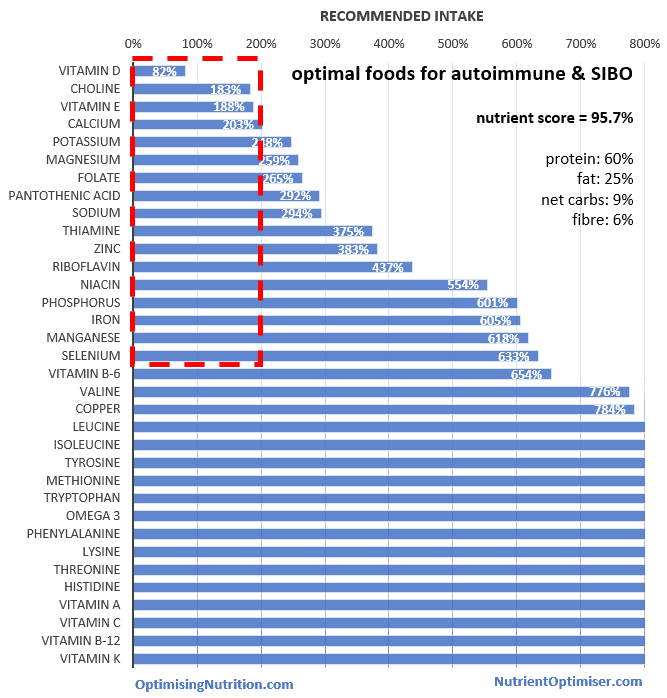 Prioritises nutrient density without focussing on amino acids It is hard to obtain adequate omega 3 or vitamin B12 on a WFPB approach and hence they may need to supplement. Weight loss is likely due to the low energy density if you are able to stick to unprocessed foods only. 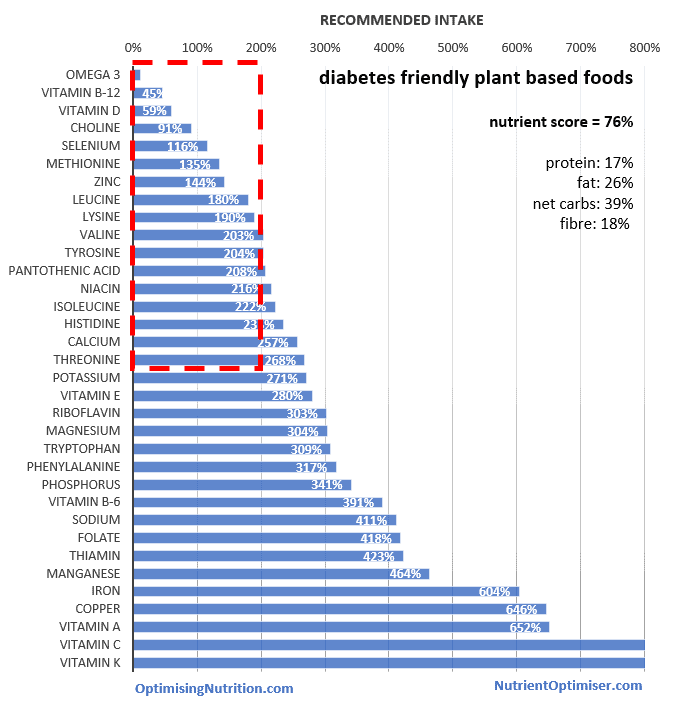 plant based (diabetes friendly) 76% Plant based only, with the focus on nutrient density and lower insulin load. 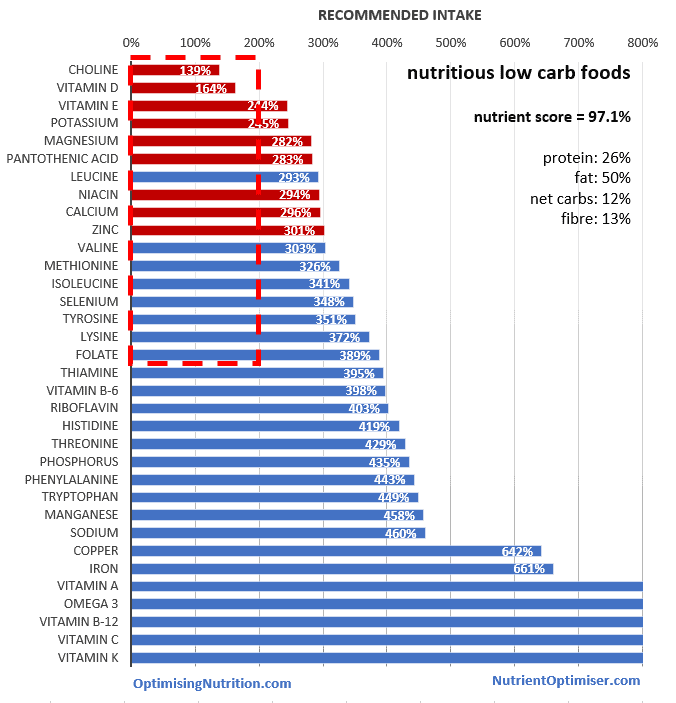 It can be quite hard to achieve a low carb diet, at least in terms of percentages without using a lot of oils or nuts. 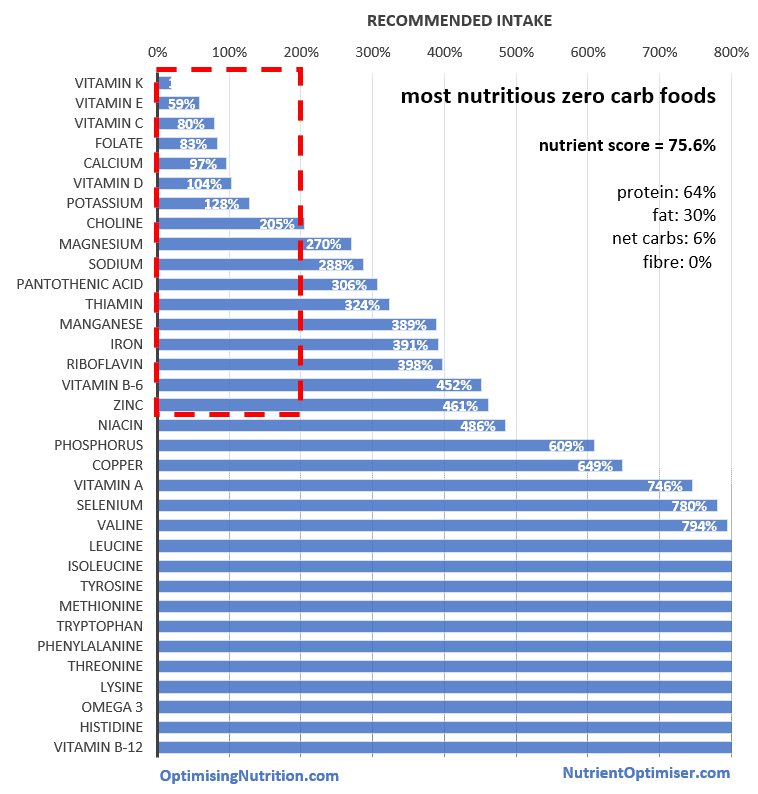 zero carb 76% Animal only foods prioritised for nutrient density. 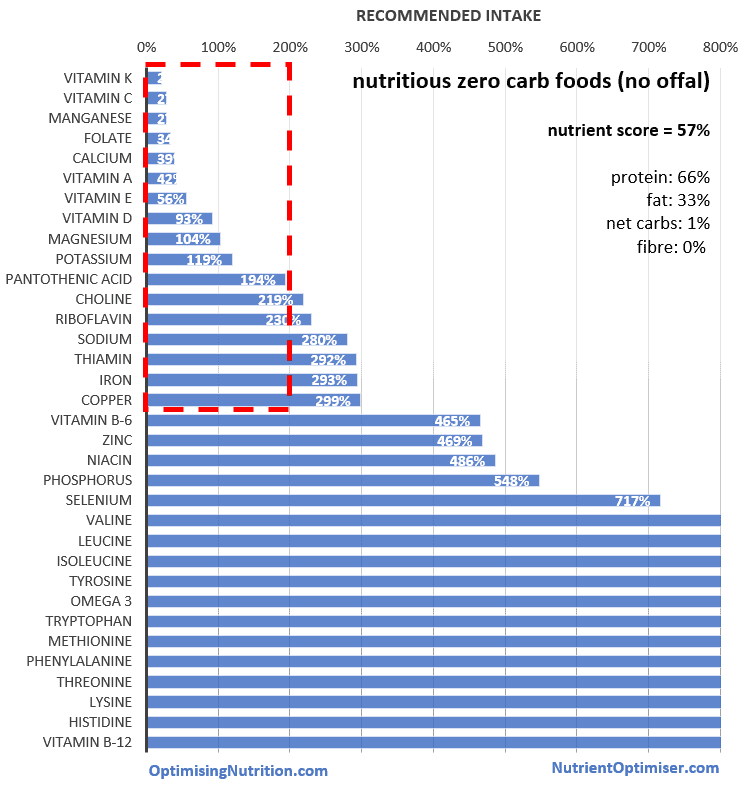 A zero carb dietary approach struggles to meet DRI for vitamins K, C and E, folate, potassium and calcium. Although some argue that nutrient requirements are different in the absence of glucose, though there is limited research to date. 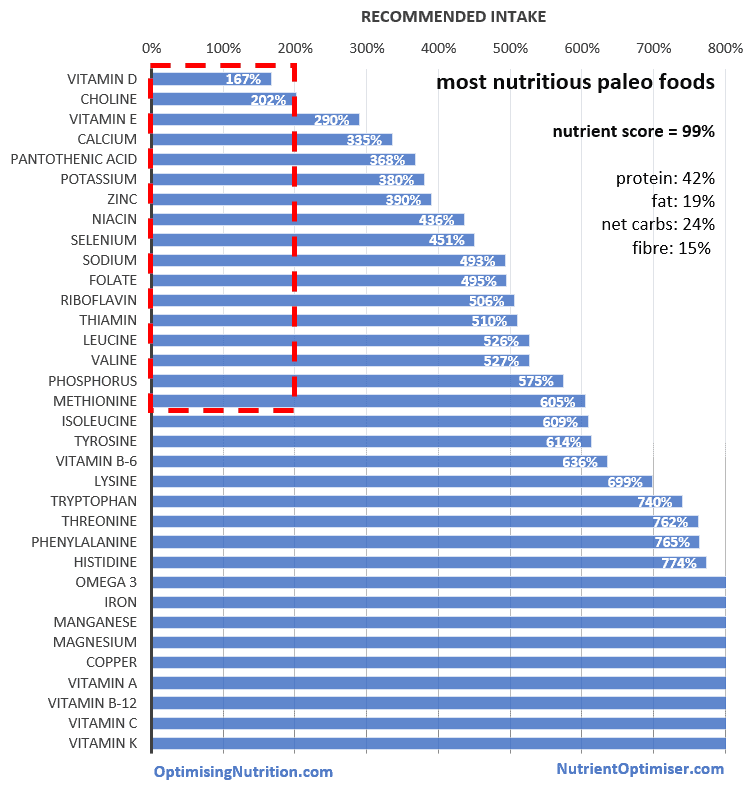 Paleo (without ND) 64% All Paleo foods without consideration of nutrient density. Limiting yourself to unprocessed “Paleo food” is no guarantee that you will achieve exceptional nutrient density. 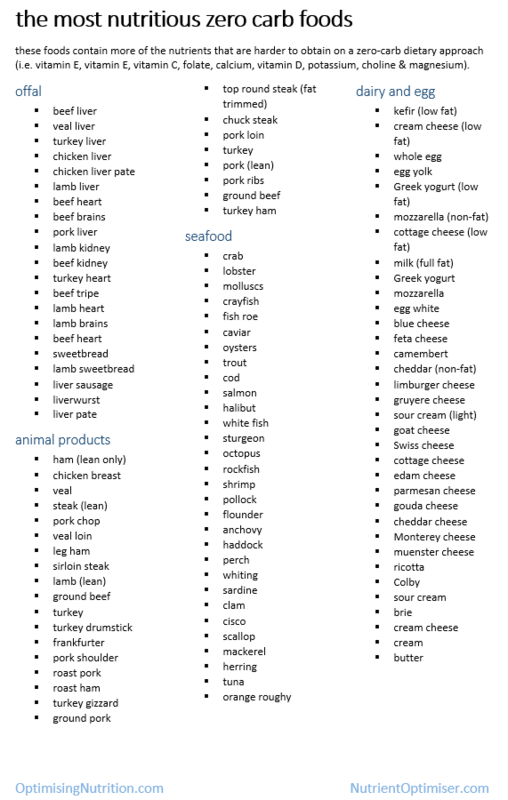 zero carb (no offal) 58% Animal based foods excluding organ meats. 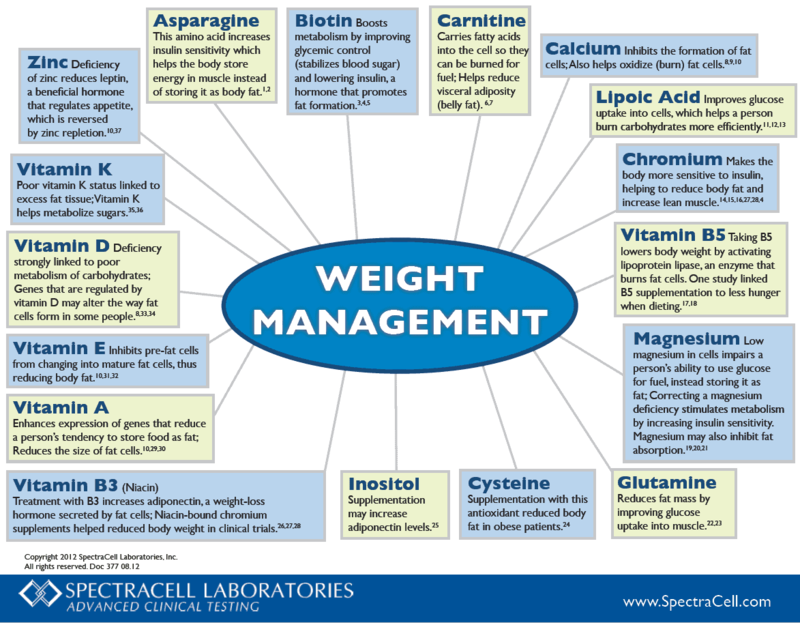 Organ meats provide a lot of the nutrients in a ZC approach. Not everyone enjoys and eats a lot of organ meats. 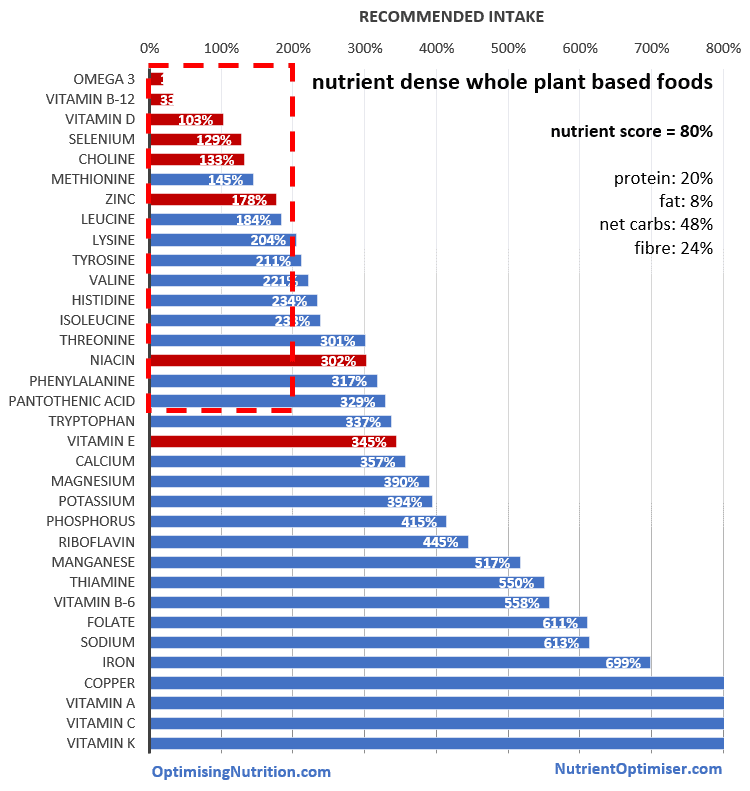 plant based (without ND) 57% All whole food plant based foods without consideration of nutrient density. A plant based nutritional approach is no guarantee that you will achieve high levels of nutrients. zero carb (without ND) 42% Zero carb without nutrient density. A zero carb approach without consideration of nutrient density can provide a poor nutritional outcome. My hope is that all this data will be useful for people seeking clear guidance on optimal food choices for them. I hope it will help you cut through the confusion and conflicts of interest that so often plague our food system. Nutrient density is the centre piece of the algorithm for optimising nutrition to suit people with different goals and to suit different circumstances. When we focus on foods that contain more of the harder-to-find nutrients we tend to boost all nutrients across the board. 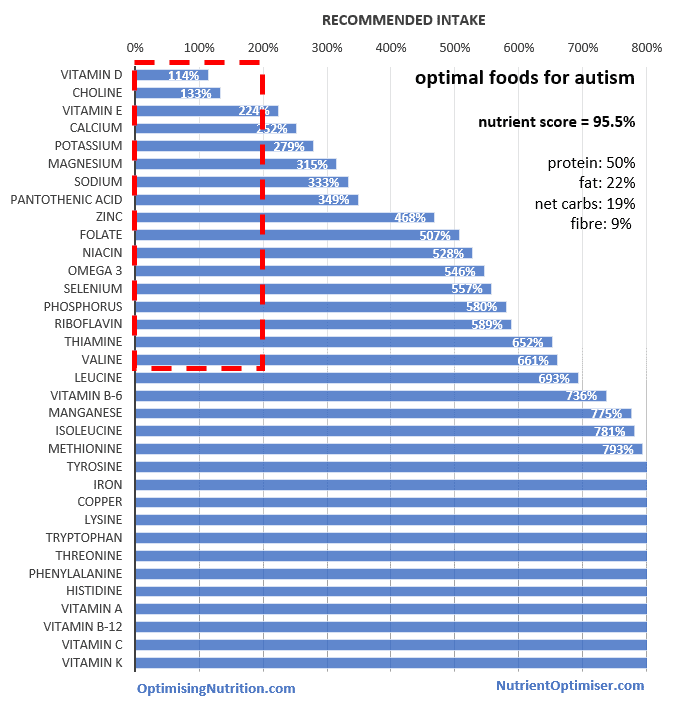 optimal short list of foods that still fit within a person’s ethical or religious system. Simply focusing on trying to consume more of the foods on these lists will go a long way to helping you achieve optimal nutrition, health and happiness. If you’re still looking for further guidance to help you refine your food choices, then I invite you check out the Nutrient Optimiser which has been designed to identify areas where you could improve your nutrition and help you fine tune your food choices to help you move towards your chosen goal and dreams, whatever they may be.